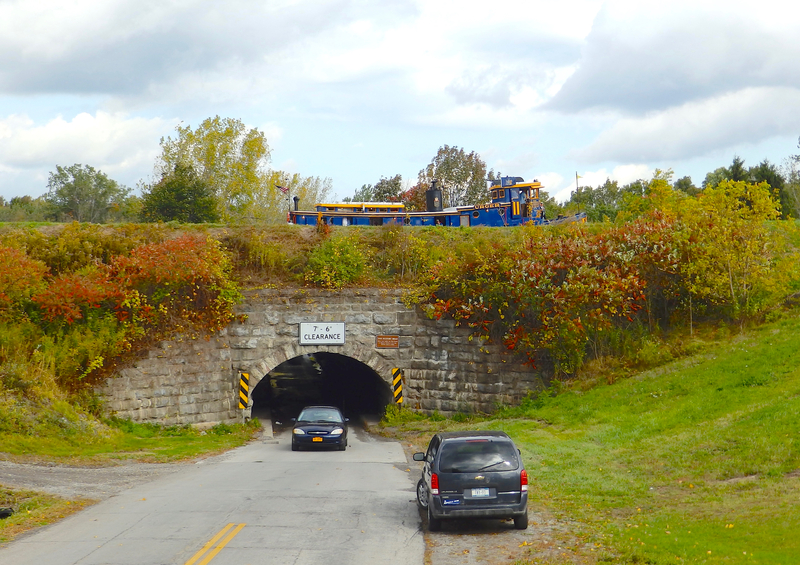 You are currently browsing the category archive for the ‘NYS Canal Corp’ category. 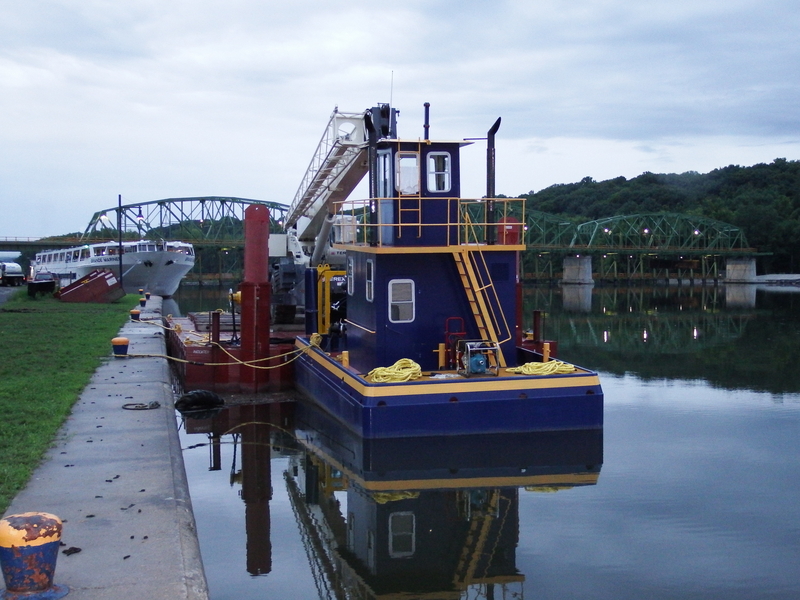 If you’re new to the blog, I’ve done lots of blog posts on a NYS Canals tug called Urger. 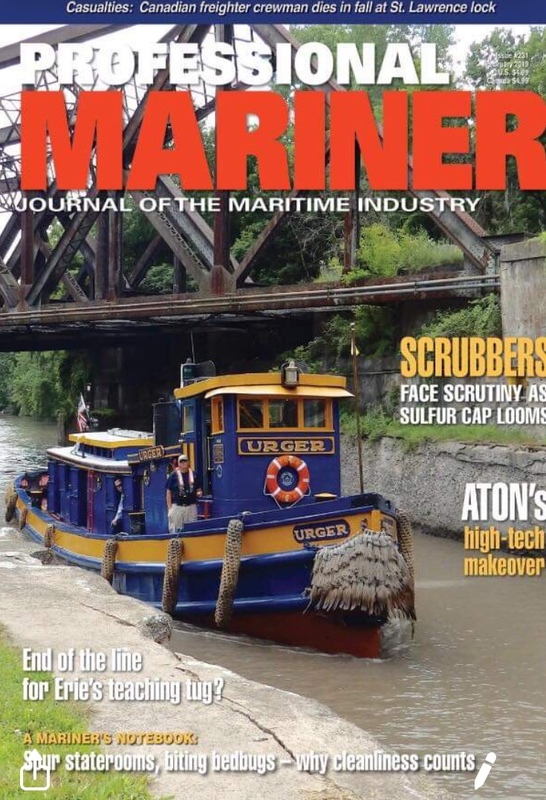 For the past 5+ years, I’ve freelanced for a great publication called ProfessionalMariner, and this month have my first cover story. I didn’t know my photo was on the cover until it came out!! 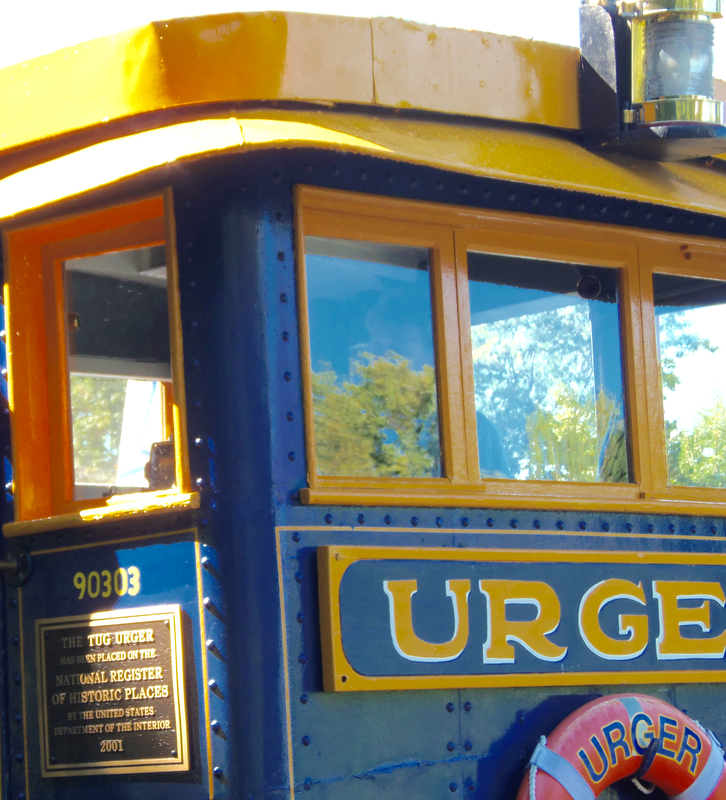 You can read my Urger article here. Another piece of Urger news I have not reported elsewhere is below. 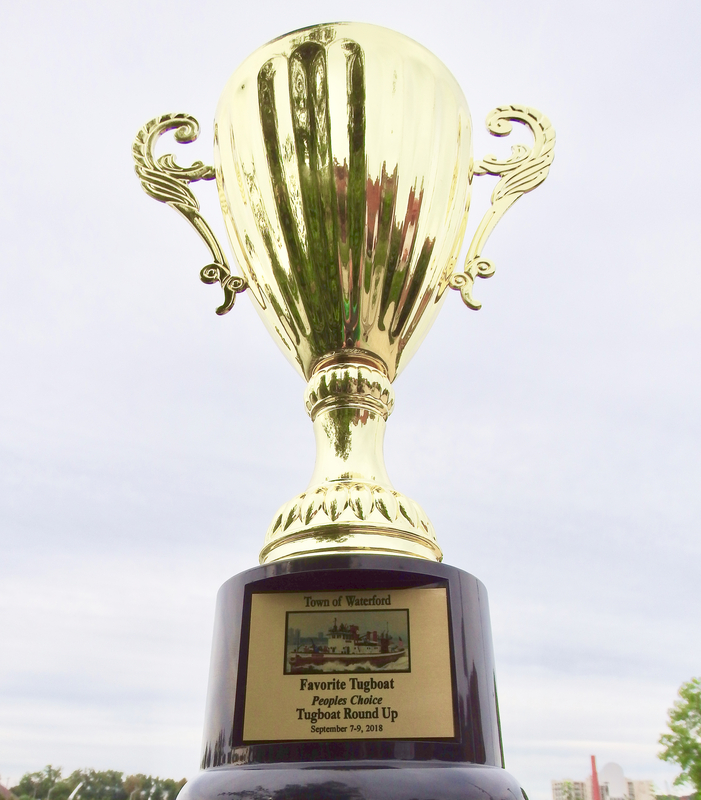 At the 2018 Waterford Tugboat Roundup, the 1901 built tug was voted “People’s Choice Favorite Tugboat,” winner of a dark horse write in campaign! Below is the trophy. Too bad the trophy has no boat to display it in for the public to see. 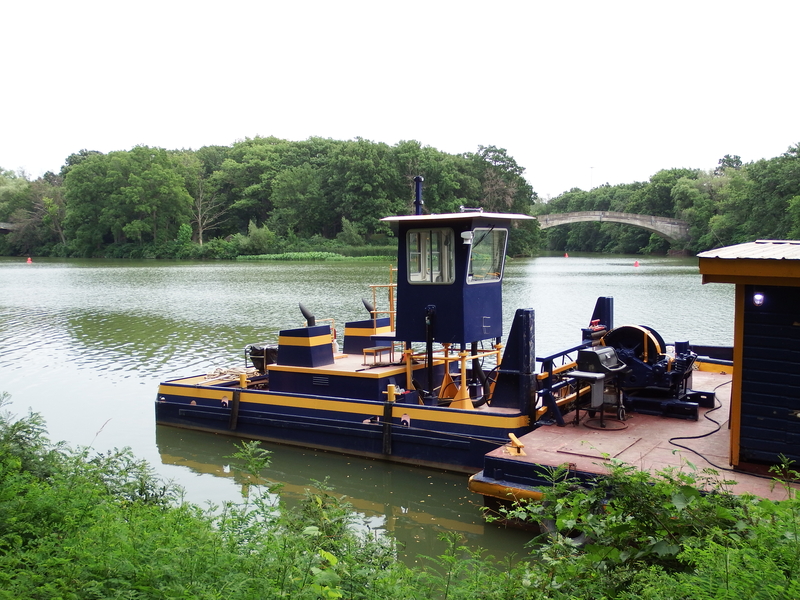 Now for big news on the political though primarily ceremonial end of things, Assembly member John McDonald III, District 108, has sponsored a bill to designate Urger as “official tugboat of the State of New York. Read it here. You can leave a note of thanks and support for Assembly member McDonald here. If you vote in NYS and want to leave a note for your own rep to encourage him or her to join with McDonald in supporting this bill, you can start the connection here. 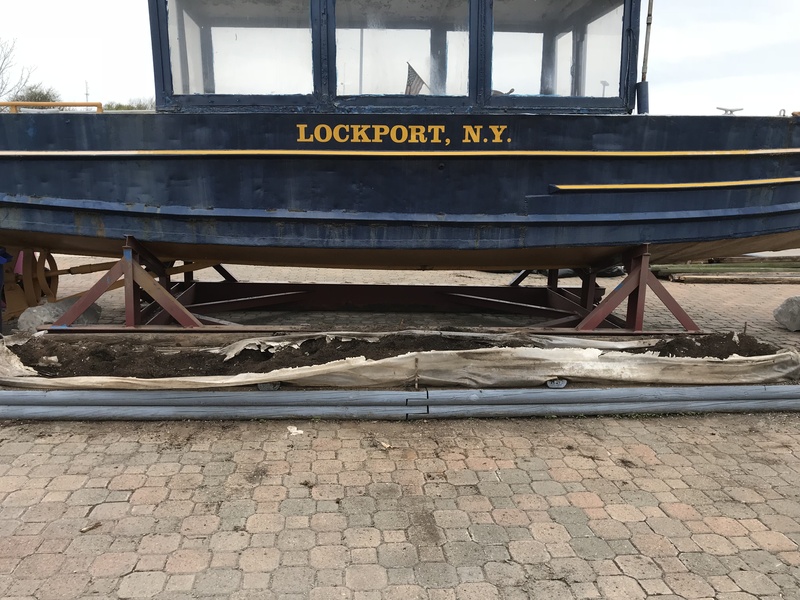 You can also write the Preservation League of New York and encourage them to continue their efforts to save this boat as a moving, floating ambassador from our state’s history. Click here for more on their efforts. And here’s yet another idea . . . a 1/12 expired Urger fundraiser calendar. 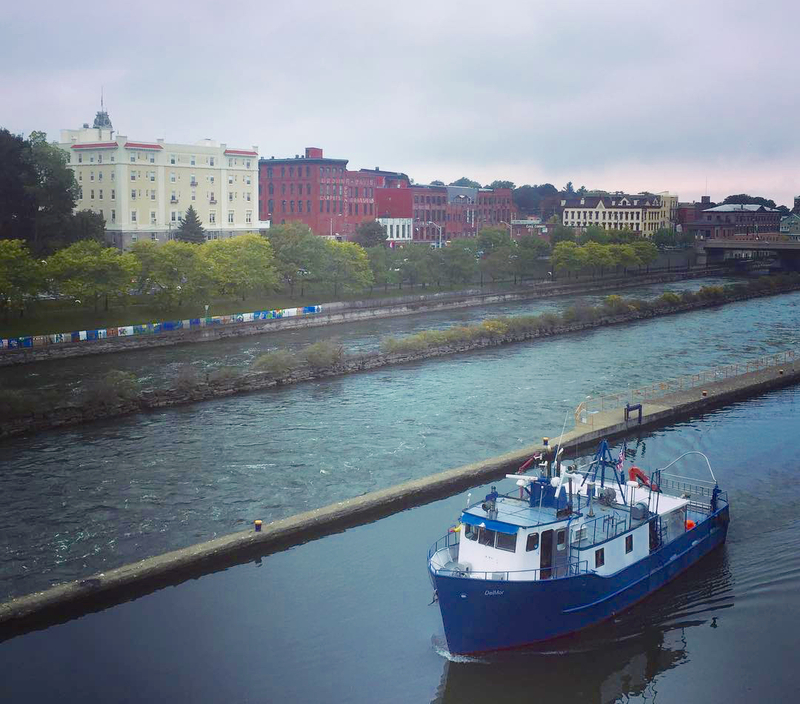 And finally, consider attending the Canal Society of New York Winter Symposium in Rochester NY on March 2. I’ll be there. Urger will surely come up. 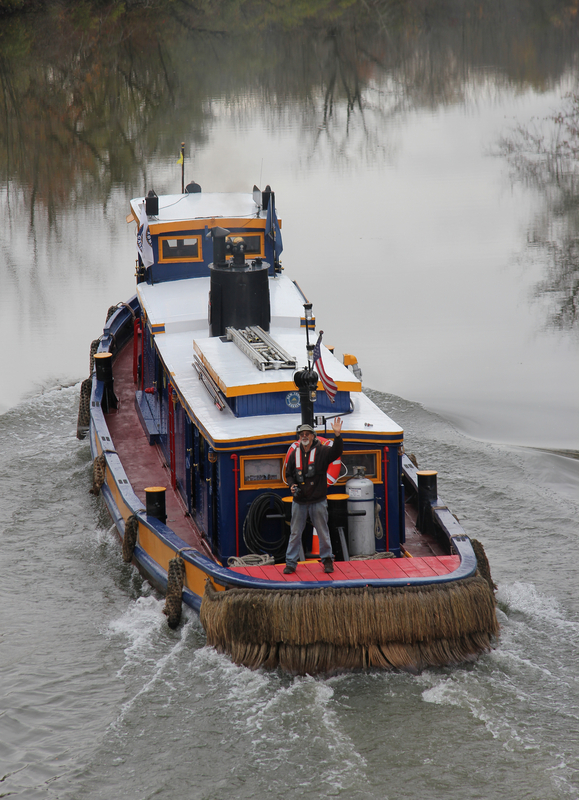 And SCOW (State Council on Waterways) . . . too bad you’ve dissolved! There’s a reference of their Urger role at the end of this post. Here are previous posts in this series. Other titles with the word hulls can be found here. I’ve taken all these photos since the start of 2019. 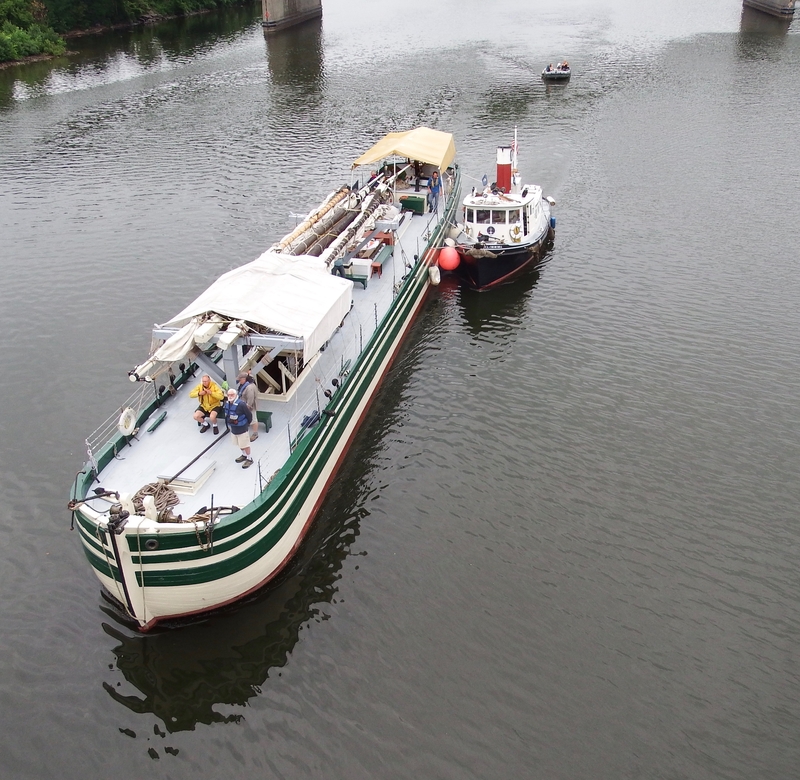 The one below is a leap forward: that’s my first view of the 1912 hull of the oft-mentioned tug I know as Grouper. 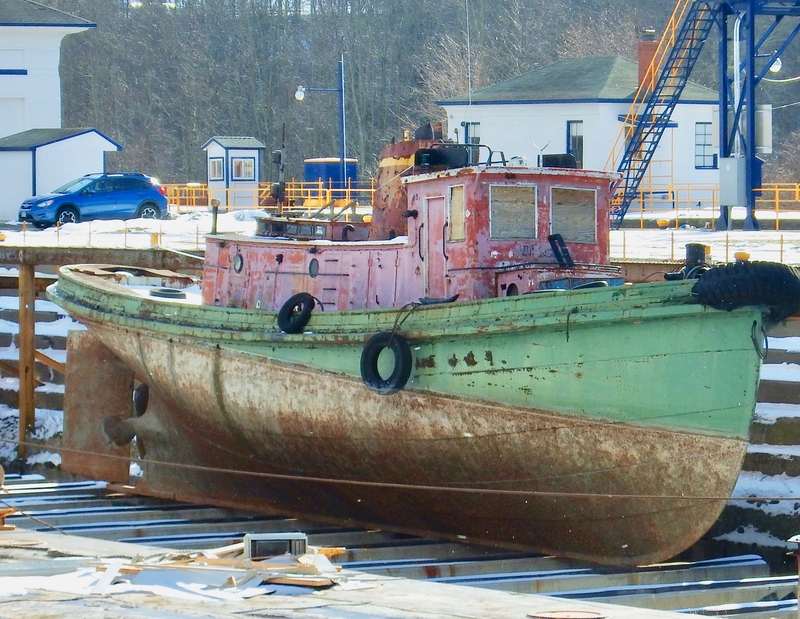 This might be the year of destiny for this 107-year-old boat, although I’ve thought that many times before. If plans are to emerge from the foundry of all possibilities, this is the time to forge them. 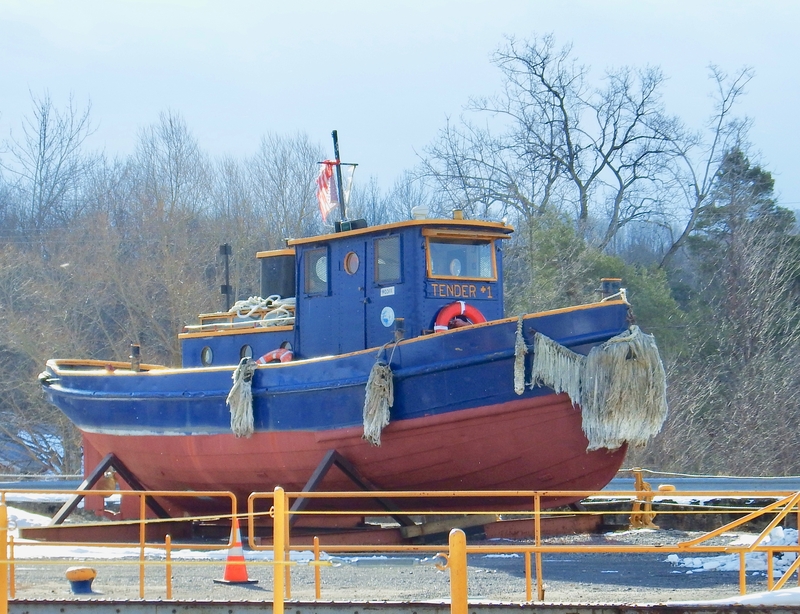 A decade and a half younger at 90 years young, Kentucky illustrates the draft on these tugs. 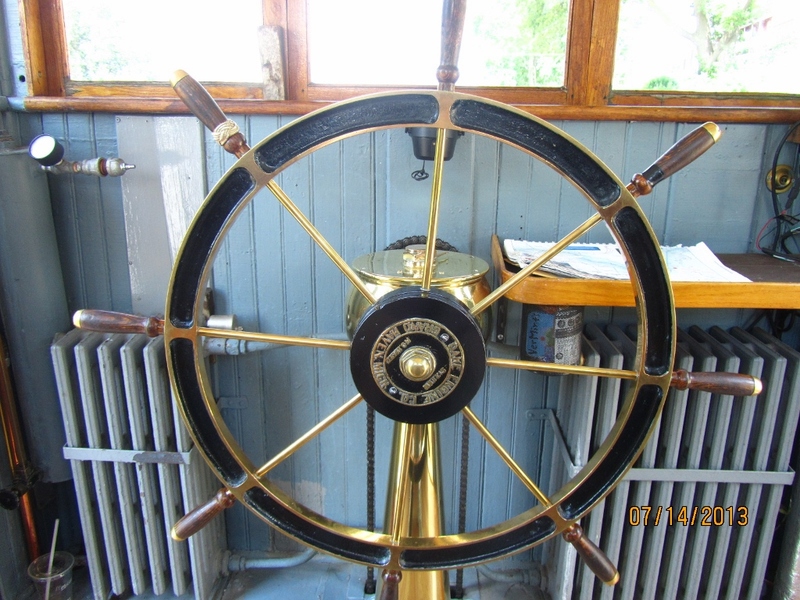 Tender #1 will also be 90 years in service this year. And finally, I don’t believe this is the 1938 Kam. But what boat is this? And why are those square openings in the hull just above the waterline? And is this the Purvis scrapyard? 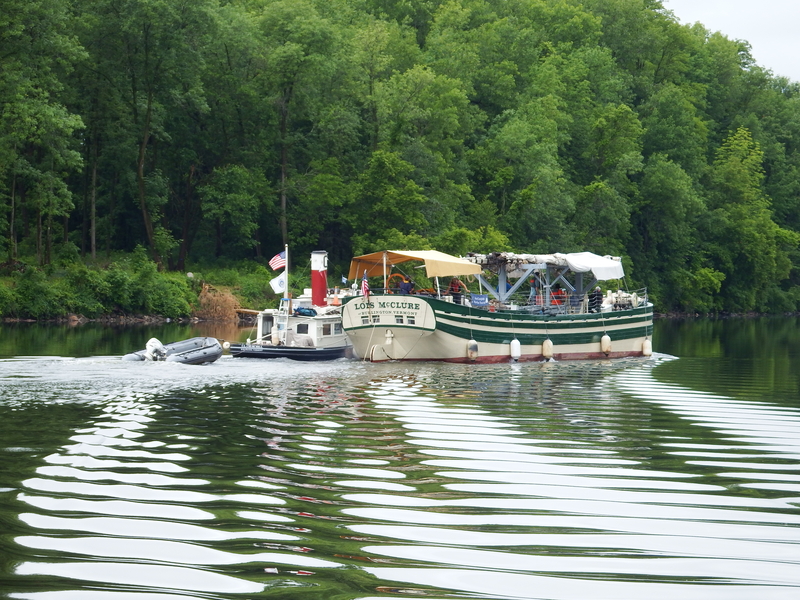 All photos by Will Van Dorp, in Lyons NY and the Soo. 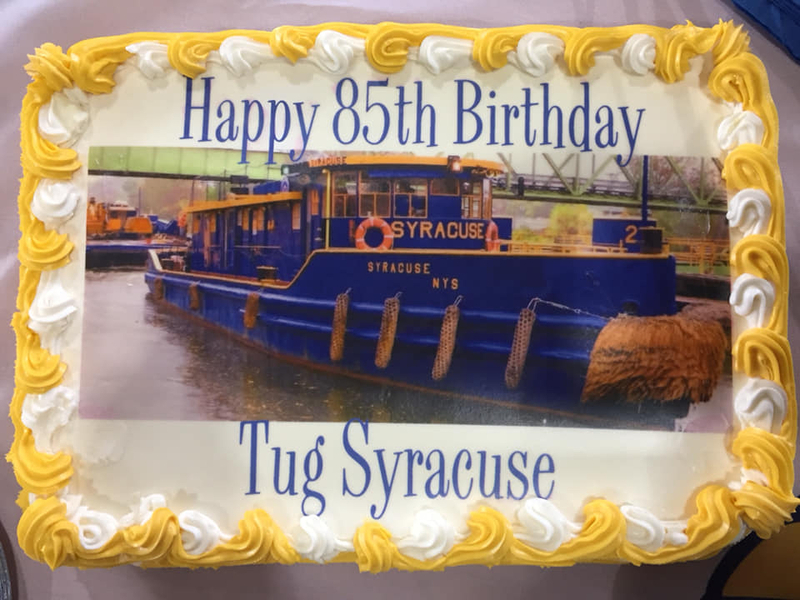 According to the archives, tug Syracuse was splashed in late 1933 and completed in spring 1934 in Syracuse Inner Harbor. 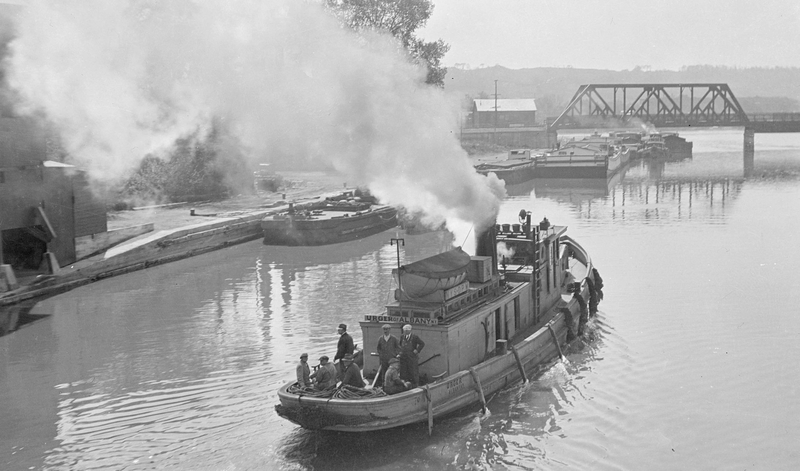 The tug was certainly the oldest entity in the Lyons area of the Canal organization. 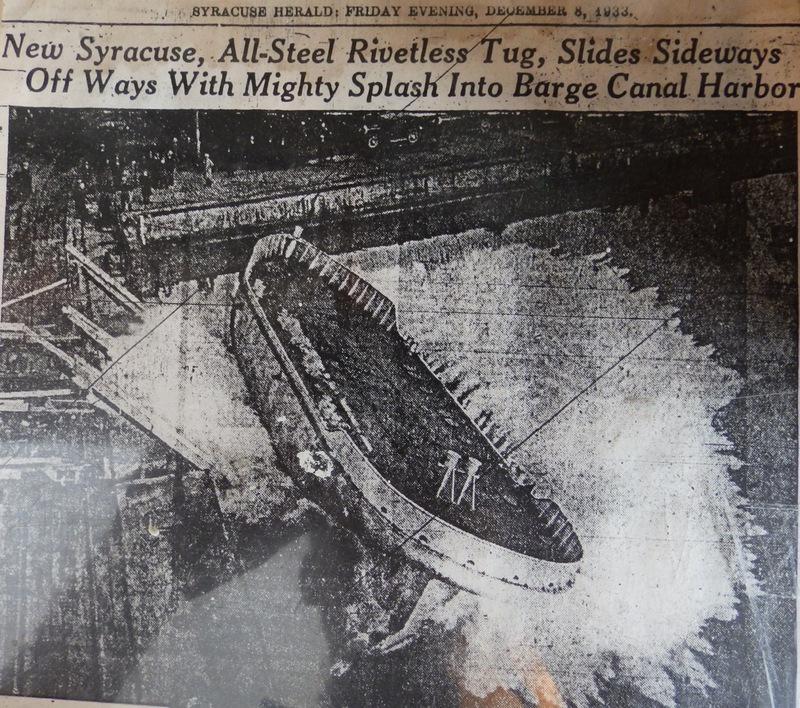 The clipping below connects the splash to early December 1933. 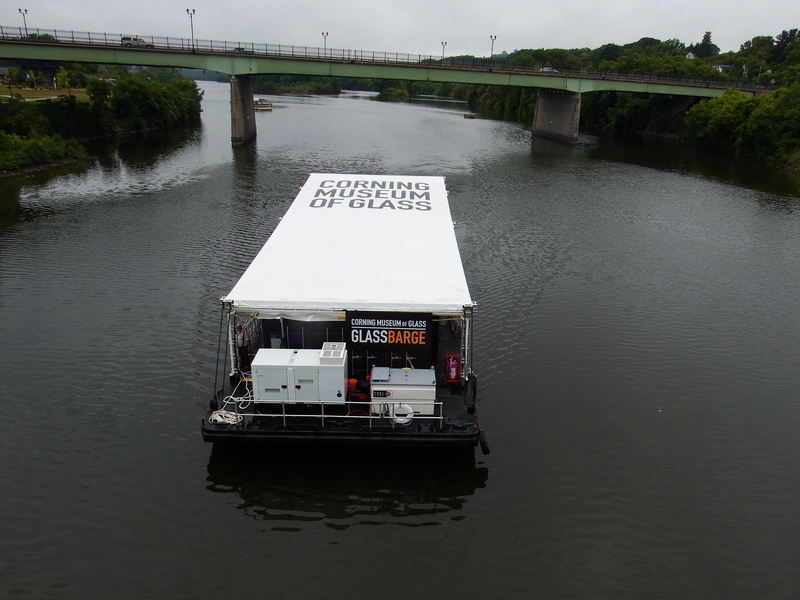 Some numbers on the boat: 77′ x 20.8′ x 9 with a 6′ 6″ prop. 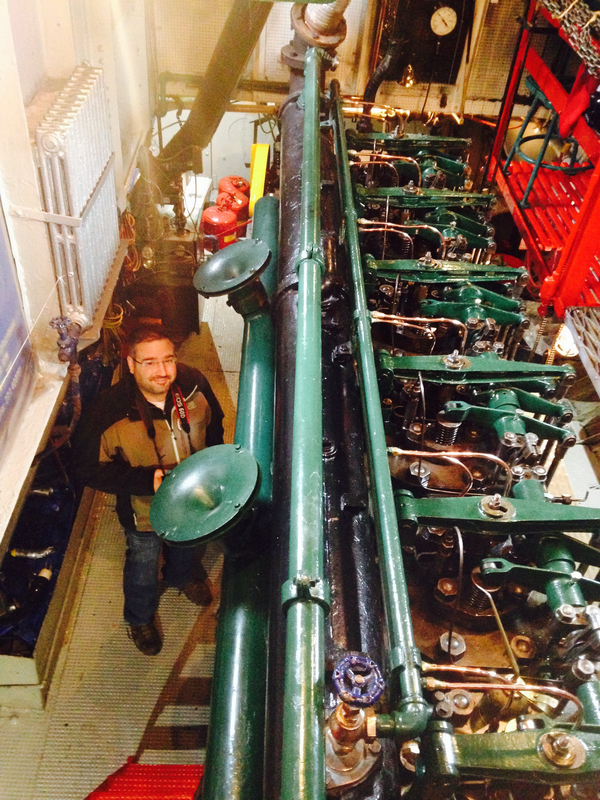 She was first built with a 250 hp steam engine from the previous tug Syracuse; in 1970, a Caterpillar 510 D379 8 cylinder was installed. 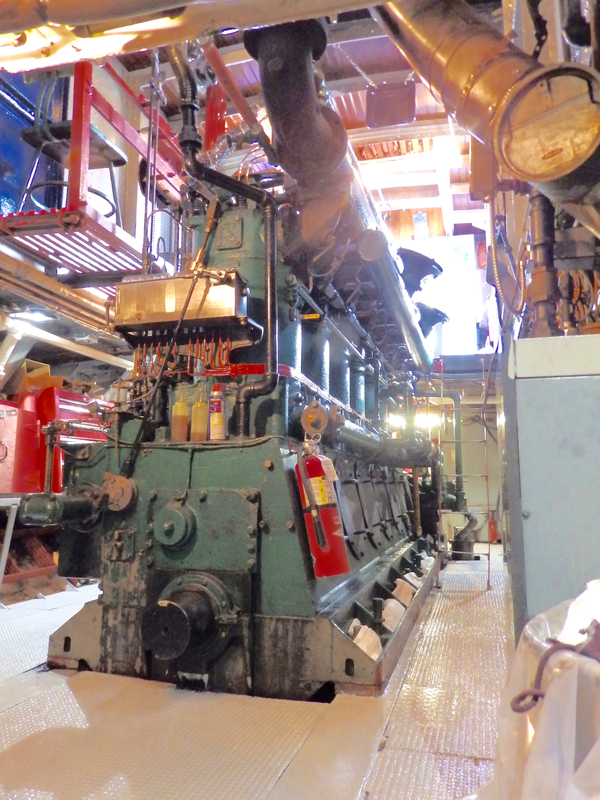 I don’t know if there was an intermediary power plant. Her 1933 $40,000 cost would be just over $750,000 in 2018 dollars. 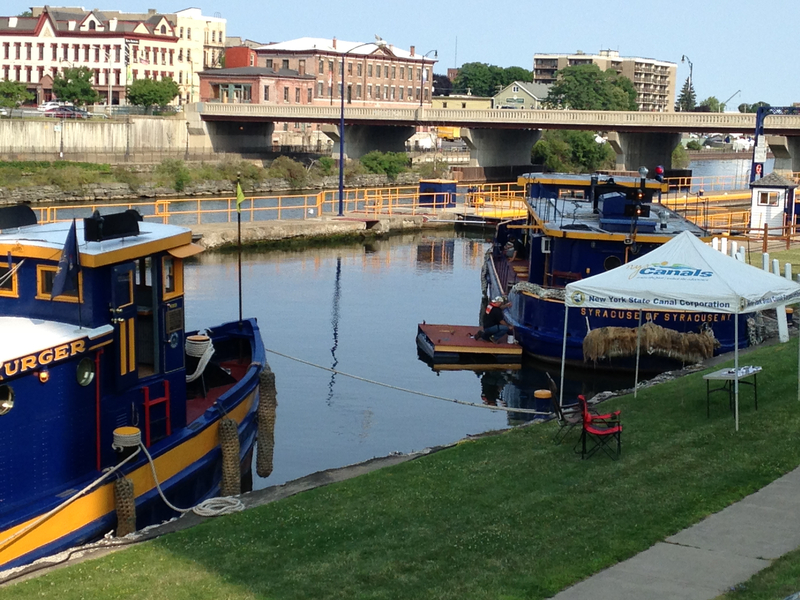 Here’s a photo of Syracuse of Syracuse NY in Oswego in July 2014. The laker in the distance is Capt. Henry Jackman of Sault Ste Marie. I’ll do another post on Syracuse soon, but for now, let me share my favorite photos of this veteran, which I took in October 2014 as we passed her with Urger. 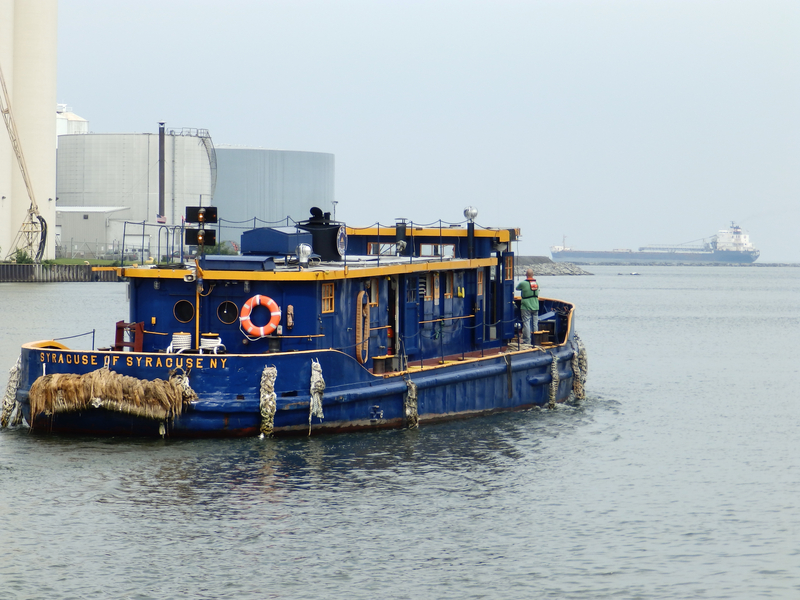 I don’t believe there’s ever been a tug that looks quite like Syracuse of Syracuse, except maybe Reliable of Utica, now owned and operated by Mr. Davy Jones. 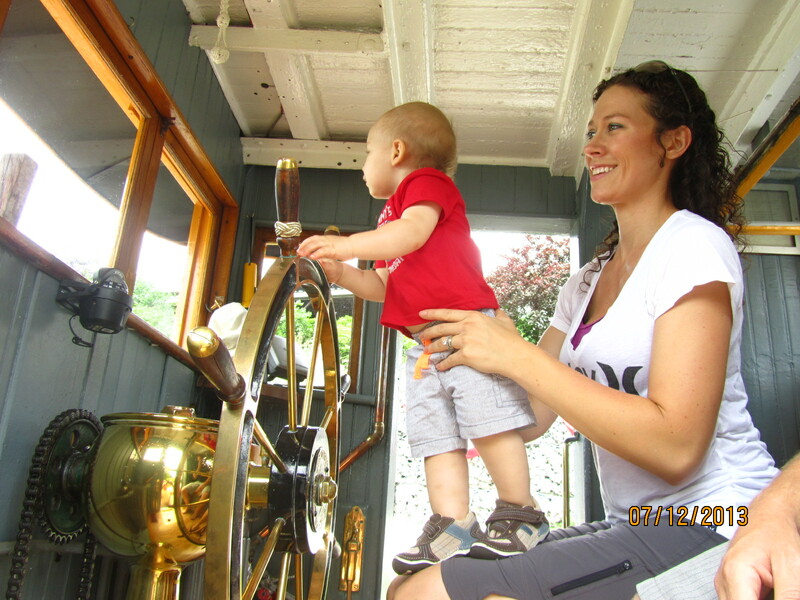 Check out these trains, cars, and even some boats of this same era here. So . . . eighty-five years working and still looking great!! 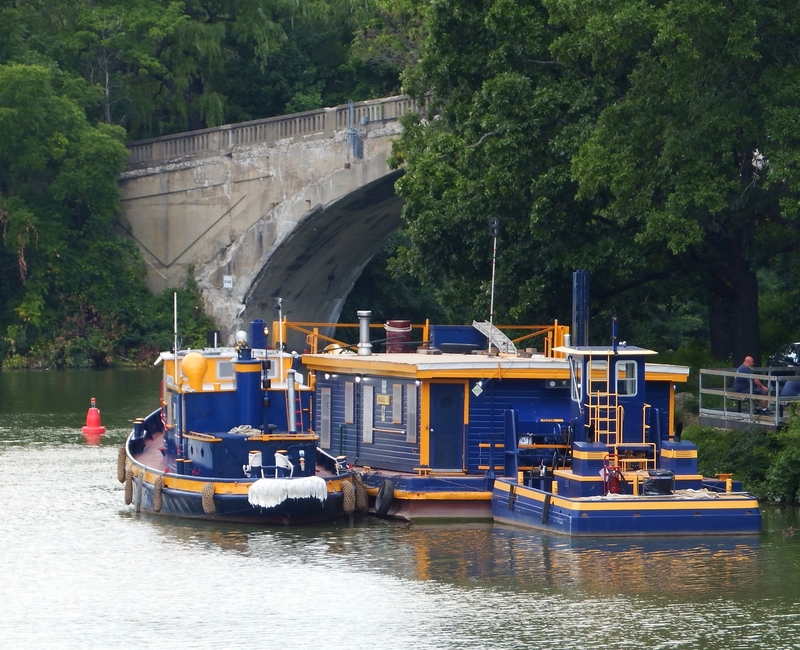 Click here for a post about a 90-year-old canal tug. The top photo by Bob Stopper; all others by Will Van Dorp. Here’s an expanded view of a photo from yesterday’s post here. What you see in the distance is bridge inspection unit, 2018. 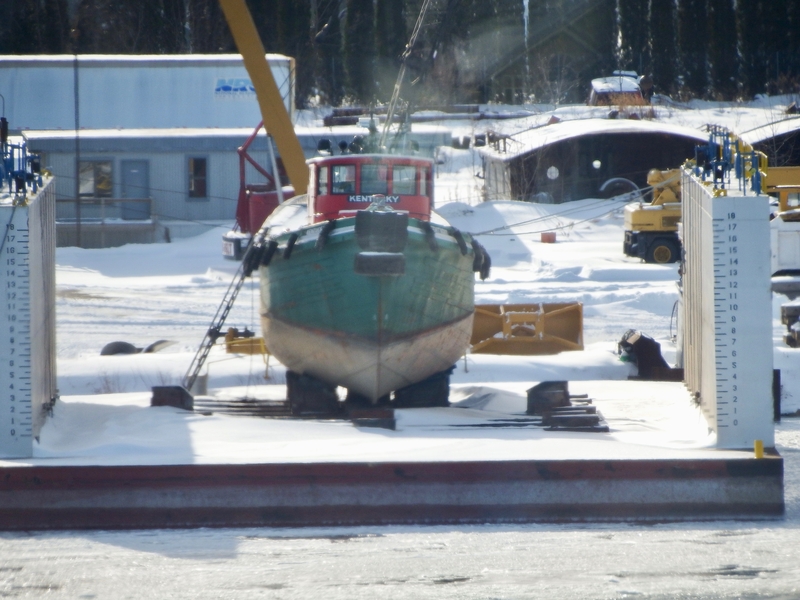 The small tug is Seaway Maid, and it’s hard to believe I’m posting a photo of it today for only the first time. 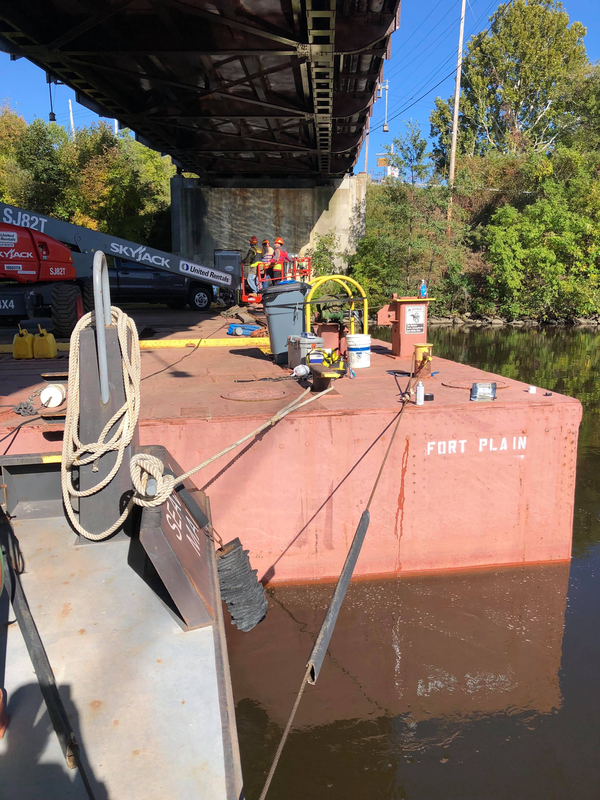 Last year this bridge inspection unit was moved through the Erie Canal by Arnold D. Actually, Seaway Maid used to be Lil Joe. 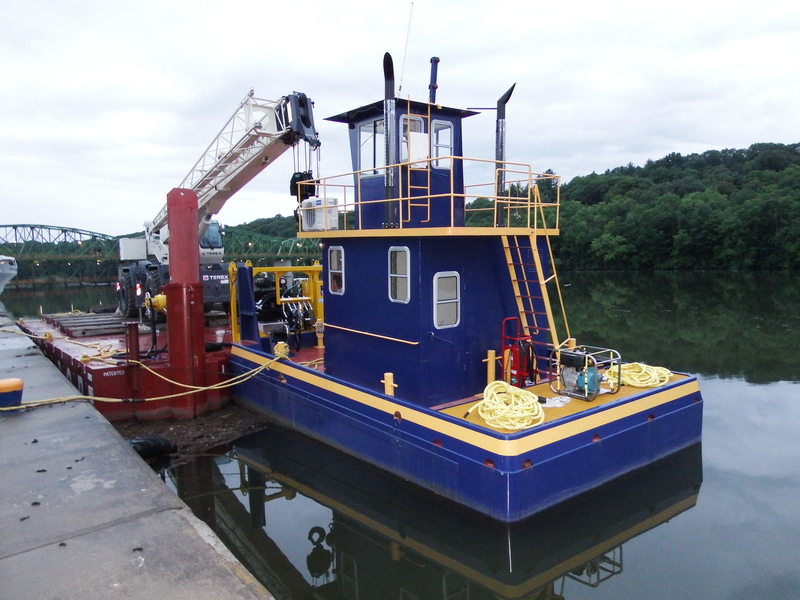 Here is a complete page of Seaway Marine Group equipment. 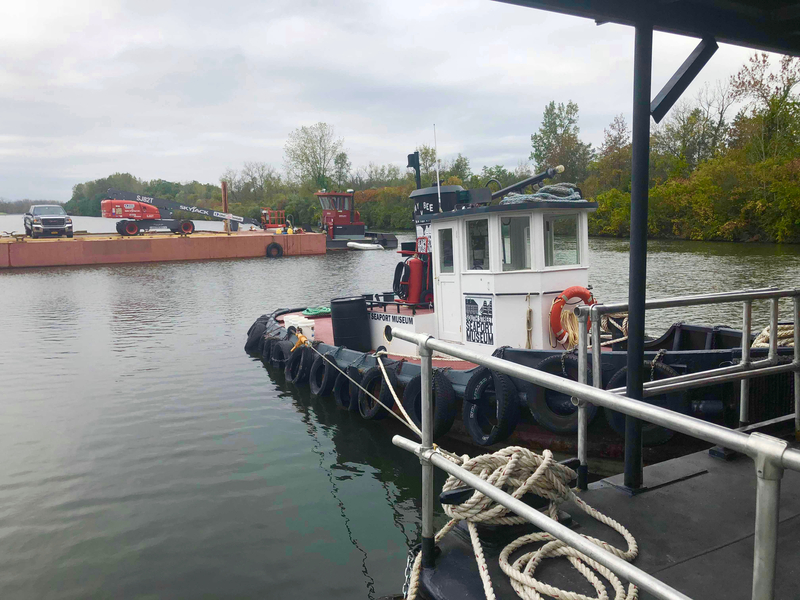 Once the tugs had full facilities and transportation to and from the job site was arranged network-wide, but this is a new era. 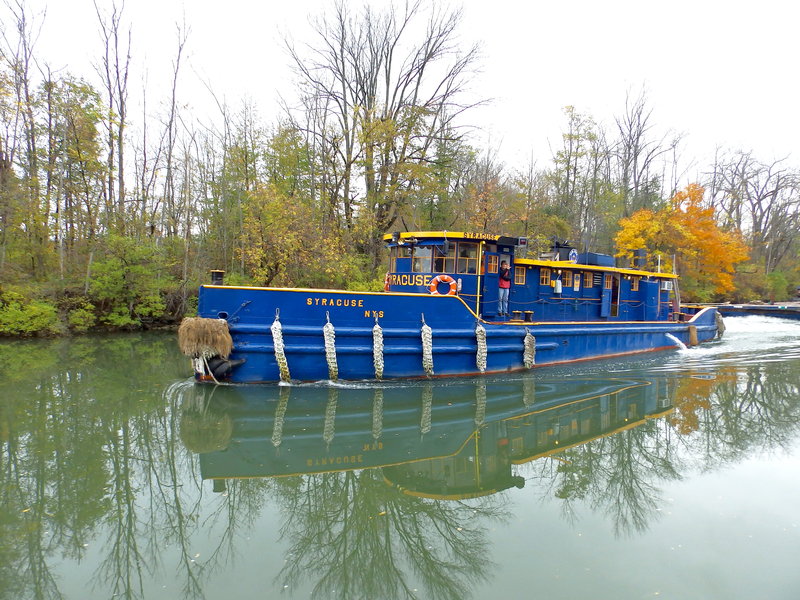 The primer painted barge, here Fort Plain, has floated around the NYS Canals for a long time. Note the rivets? 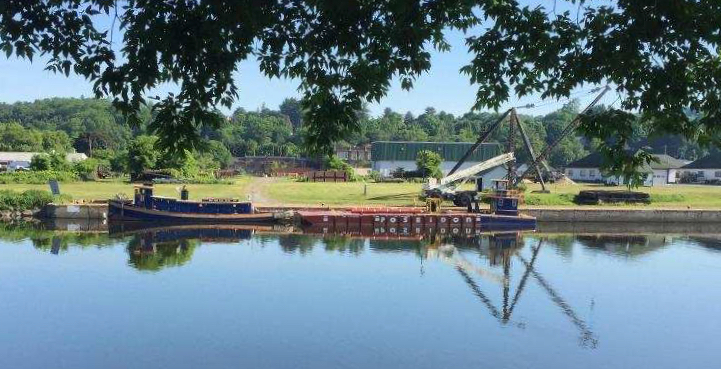 Judging by the dimensions of the barge, it was once Dipper Dredge #1 aka Fort Plain a by the NYS Barge Canal. 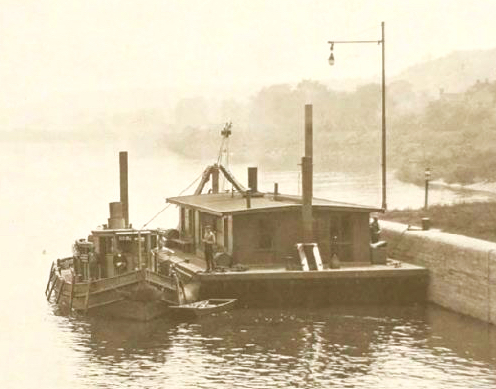 The dredge was acquired by the state in 1931. 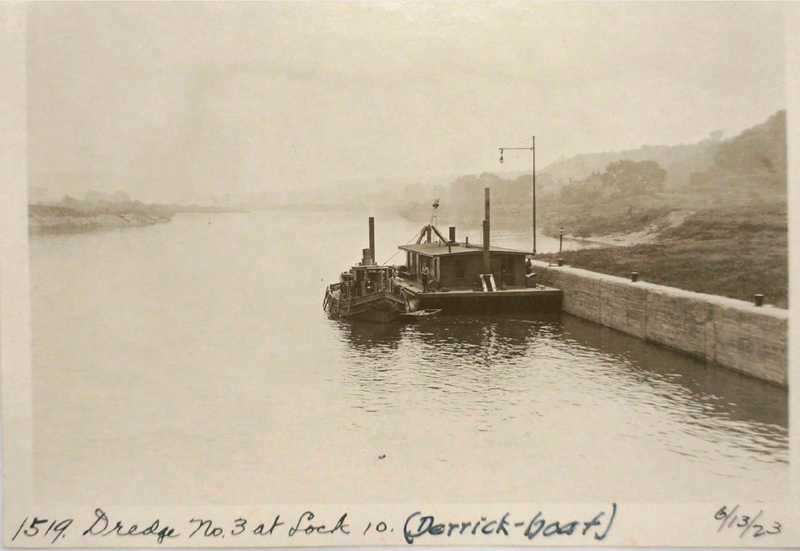 As acquired, she was Derrick Boat #10, shown below 95 years ago! 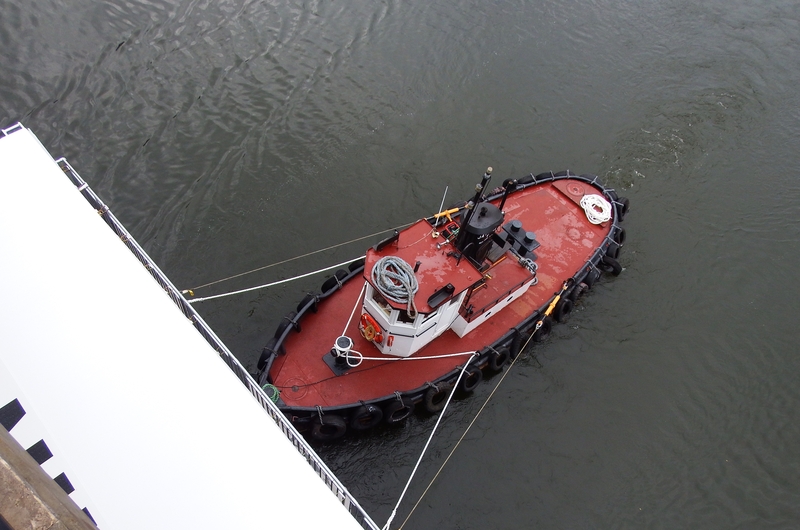 I’m wondering what tug that was moving the derrick boat around. Any help? All photos by Jake Van Reenen and the archives. And another reminder . 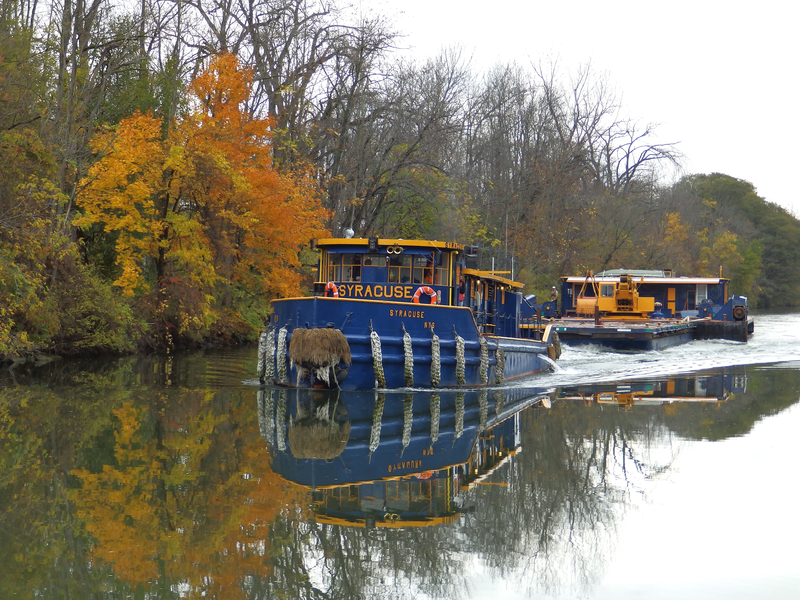 . . the NYS Canal Conference is happening on Staten Island next week. I will show Graves of Arthur Kill and speak on a panel about the hidden places of the sixth born this coming Monday and Tuesday. 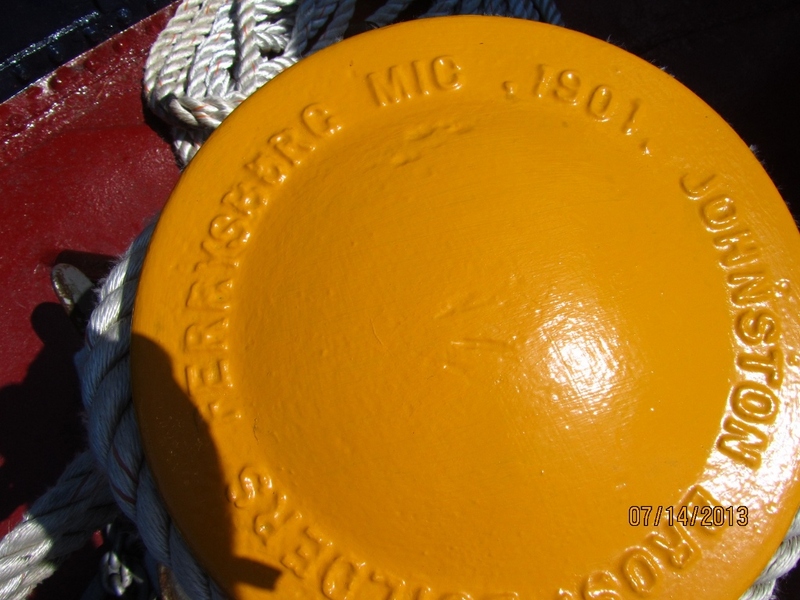 Click here for one of many posts on buoy boats. 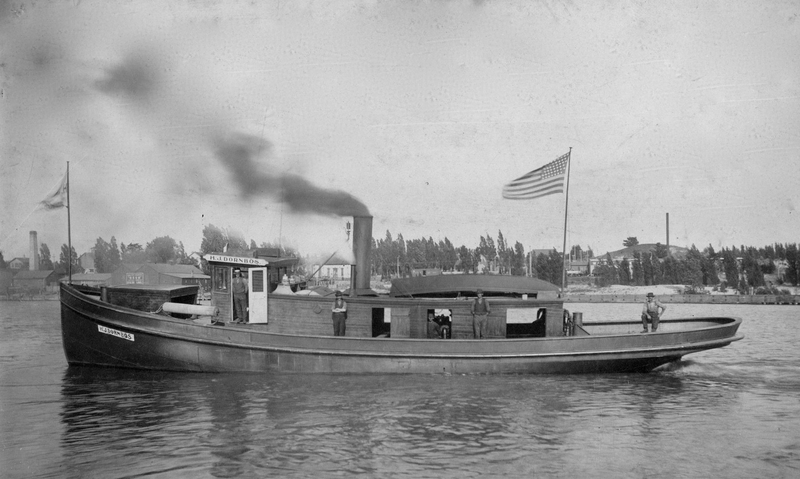 Just recently I learned the first three wooden buoy boats were built in Tonawanda by the Richardson Boat Company. That explains why they have lines that hint at yacht origins, no matter they were designed for maintenance tasks on the Canal. The next two photos I took back in 2014. 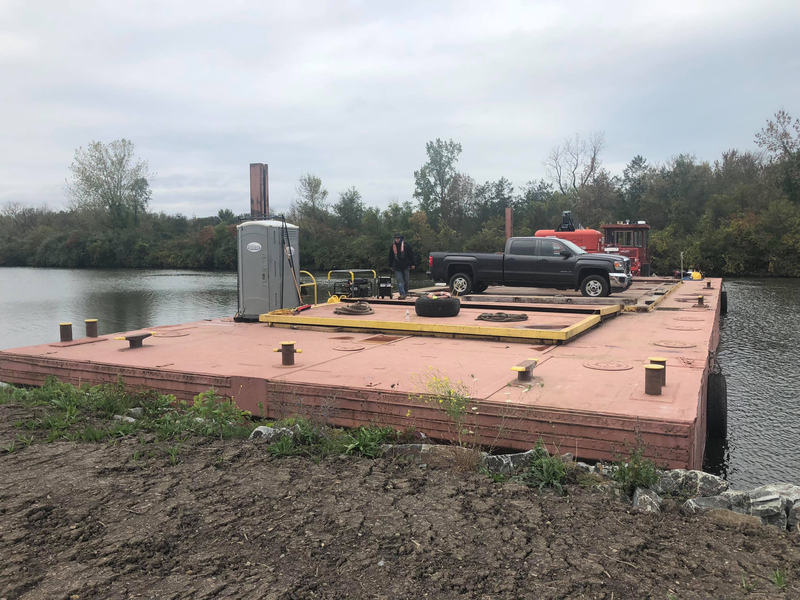 “I started about 18 years ago taking care of the flower bed that was in front of the boat. Over the years the bed was falling apart. This year I decided to build a new flower bed. I am currently working with our local Boy Scouts. I designed the flower bed and they will build it as an Eagle Project along with helping me paint the boat. 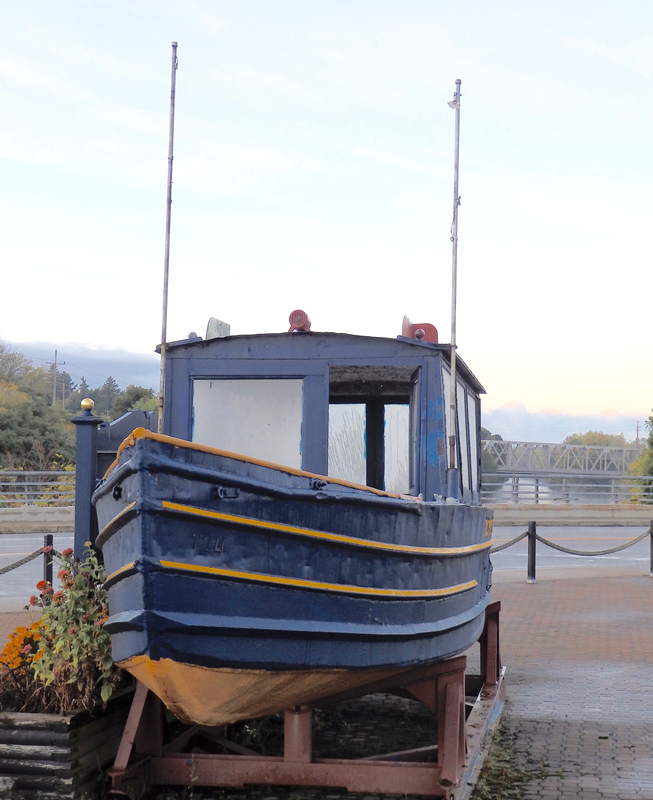 As for the boat over the years I have watched the boat deteriorate and thought what better time than now to update it. 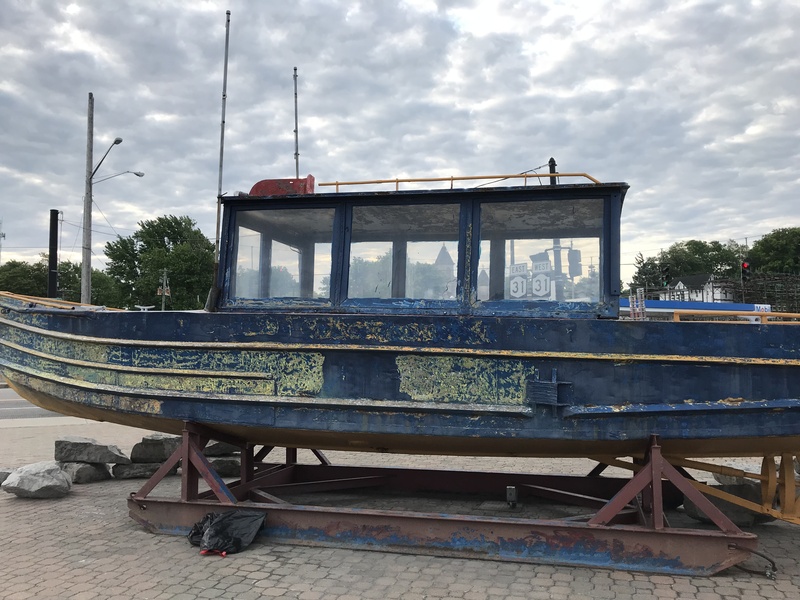 It is a piece of our history that was just rotting away and I didn’t want to see this happen, especially since the boat faces one of the main entrances to our city. The flower bed and dirt were removed. 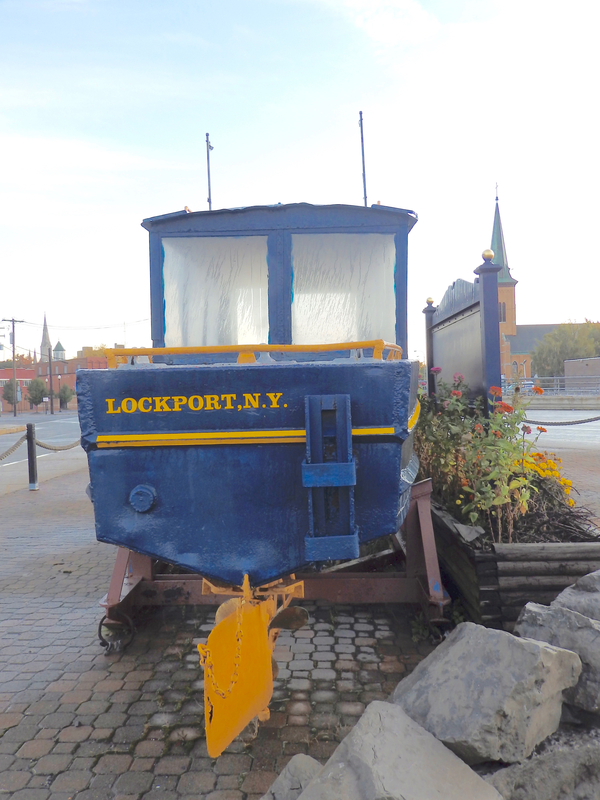 Ditto the “Welcome to Lockport” sign to be cleaned and repaired. 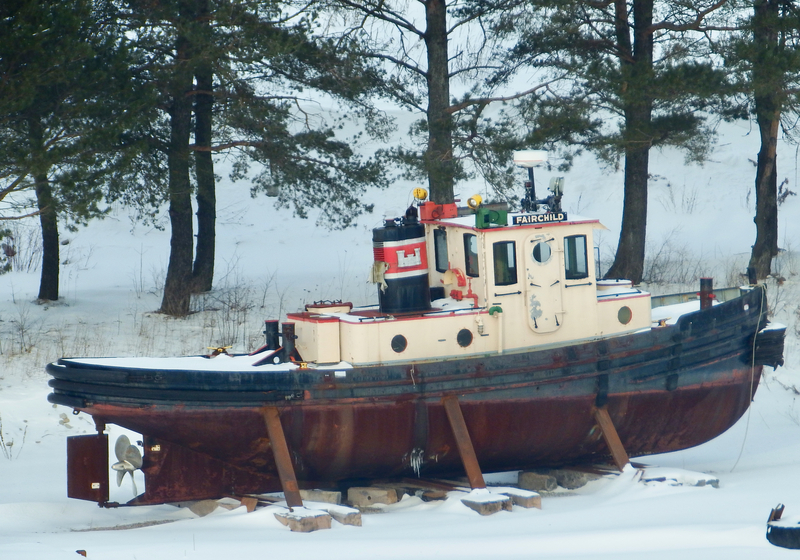 The boat was sanded and scraped. Holes in the boat were patched. New paint applied. Old windows removed, holes caulked, old door replaced, windows made and painted, and new windows cut from Lexan. Inside there are a couple tanks that are being cleaned and rust proofed. 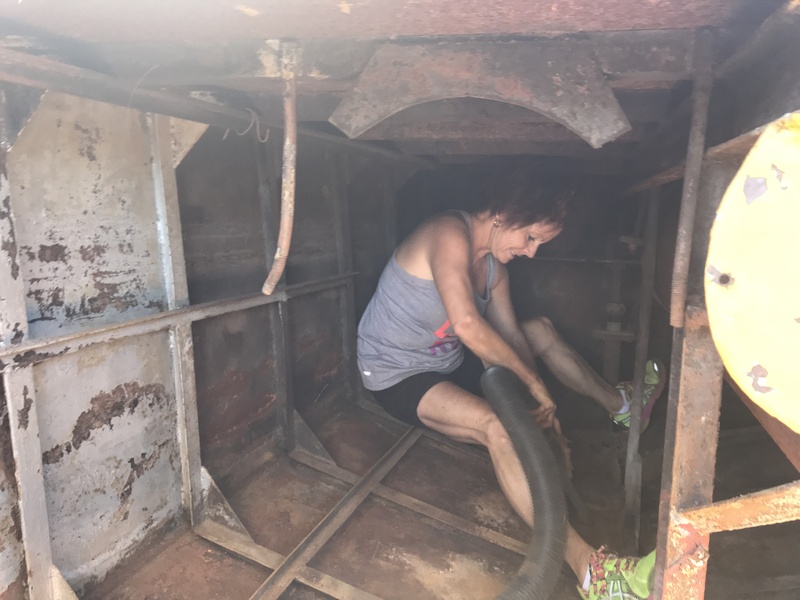 The inside the hull is scraped and debris removed. 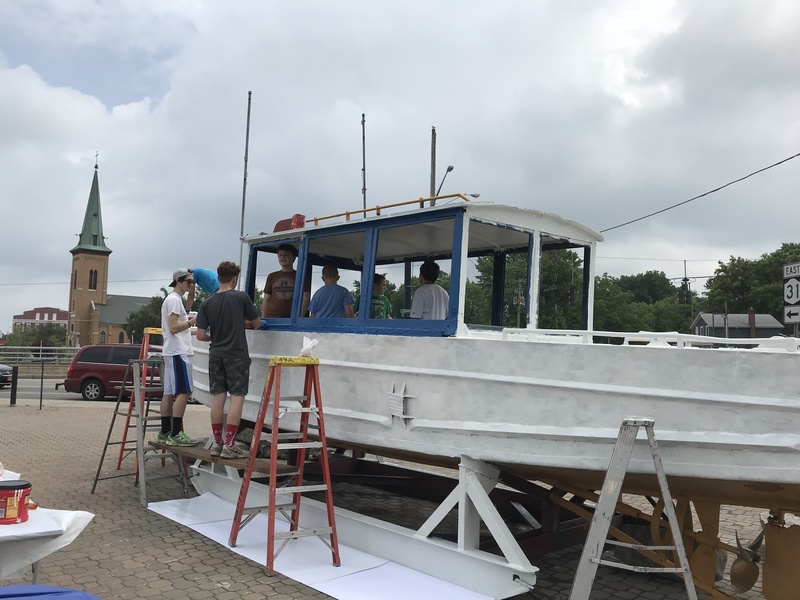 Tasks remaining: rustproof paint the interior, re-install the tanks, install new marine decking, rebuild the flowerbed and plant it, re-install the welcome sign, install a “Thank you” sign to individuals and businesses that have helped in the project. Put on new BB 110 sign. 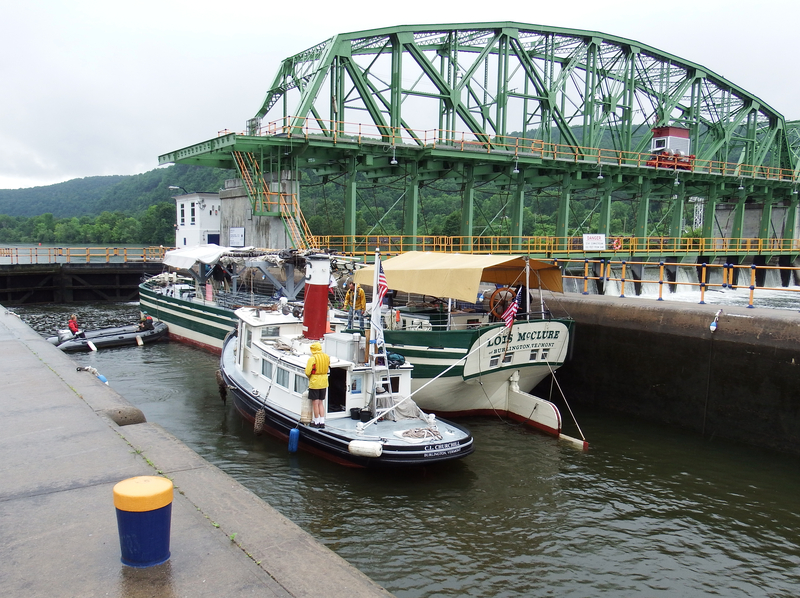 Raise three flags: US, NY, and NYS Canals. Hats off to Cookie and her crew. 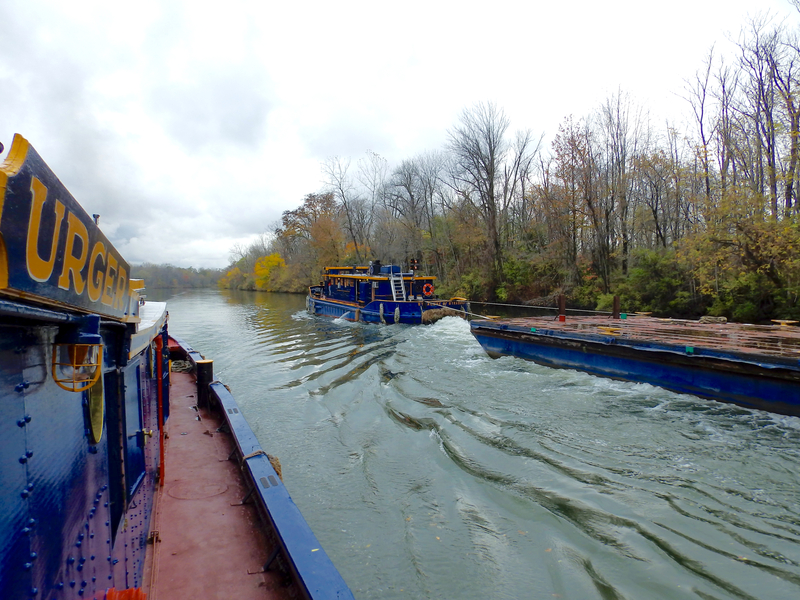 And while we’re on the western end of the Canal, check out this excellent addition to blogs about the NYS Canals. It’s called Travels with Tug DeWitt Clinton. 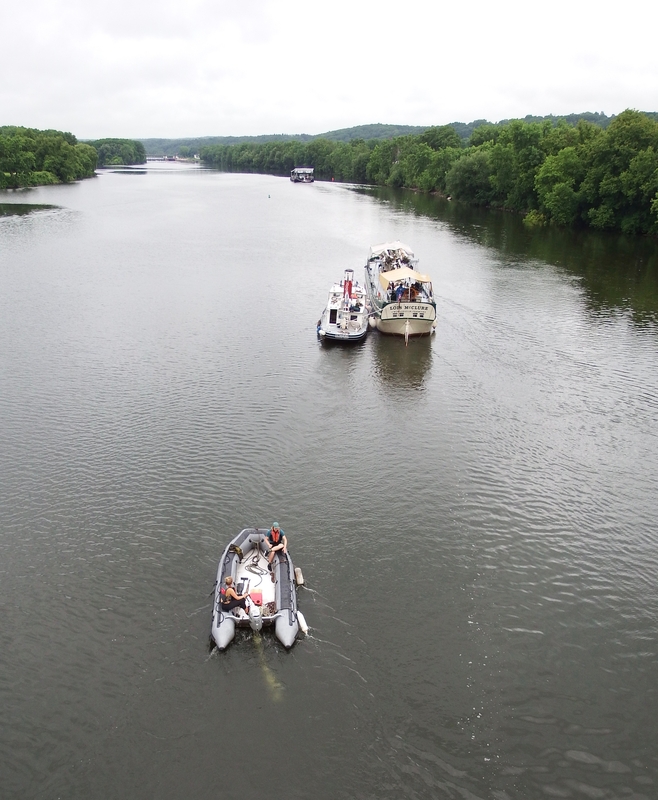 Meanwhile, up in central New York, here’s an article about a floating protest of Canal vessel reefing from the Finger Lakes Times. The last time we saw Jay Bee V, she was solo and reportedly beginning an epic. 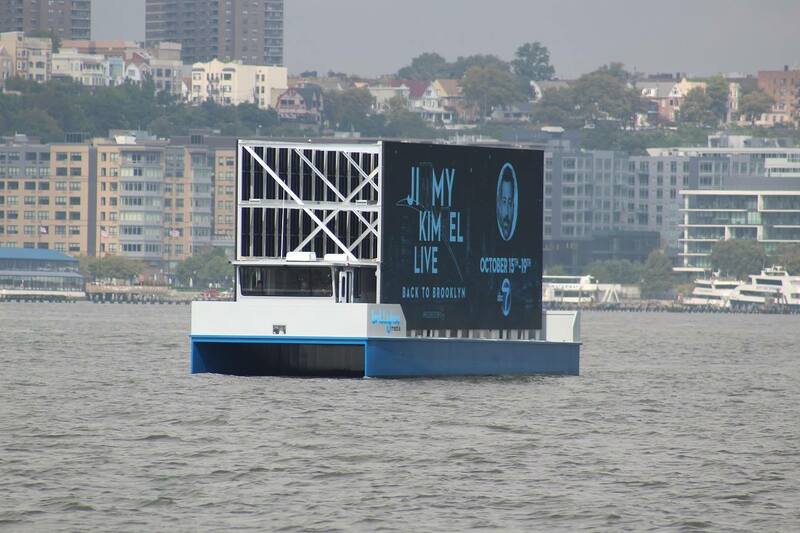 That was nine days ago, and now Jay Bee V (JBV) has taken over this large white barge from larger river tugs and is heading west with a a flotilla that began over a month ago in Brooklyn. Click here for specifics on this journey as well as sponsors, and there are many. 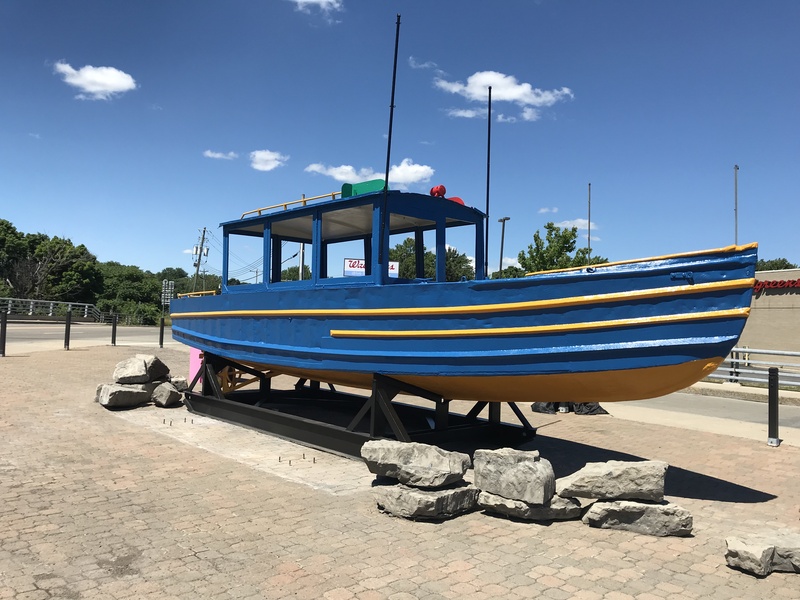 the boats of Lake Champlain Maritime Museum. 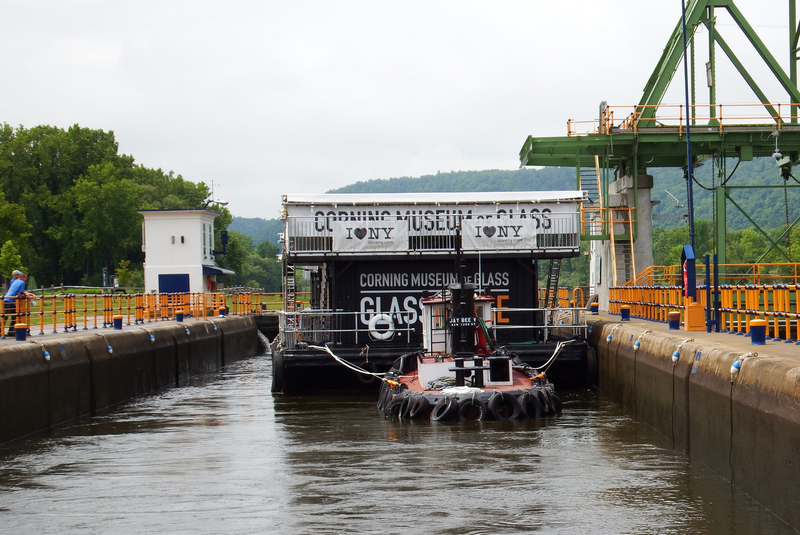 Way in the distance, that’s the glass barge and beyond that, lock E-11. 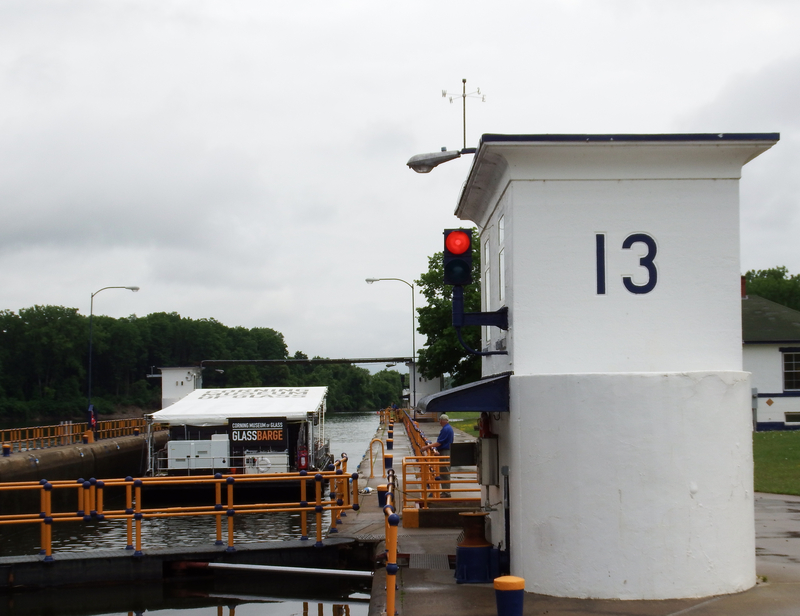 Here from tug44 a few years back is more info on lock E-11. 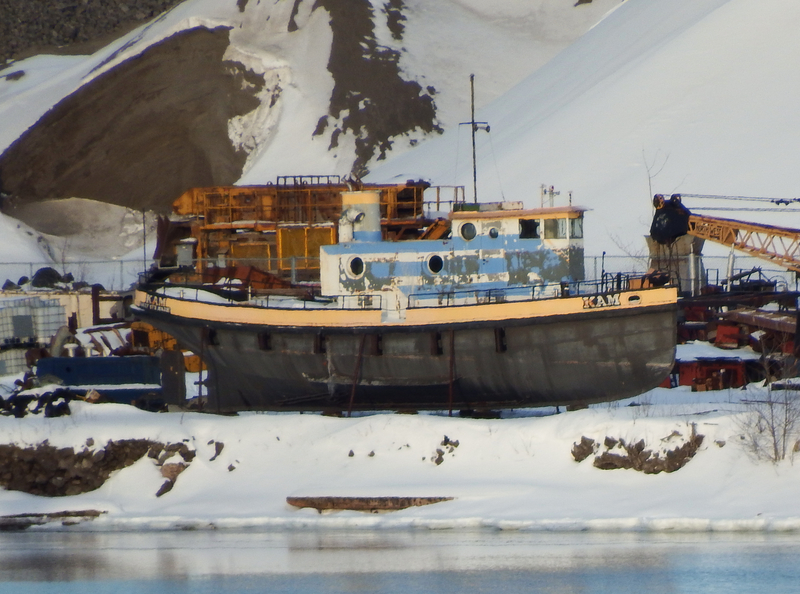 If this photo illustrates nothing, it shows how JBV‘s captain relies on understanding and communication from the watch stander on the barge. before locking up through E-13. 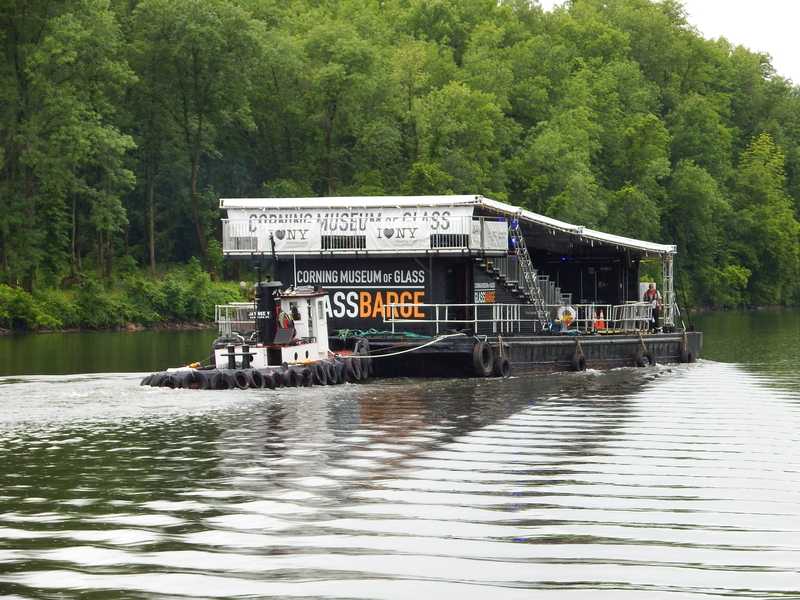 The glass barge flotilla had given its 8th set of shows (by my count) in Amsterdam the day before. To understand the impact of these shows, think canal-traveling circus of the 19th century. 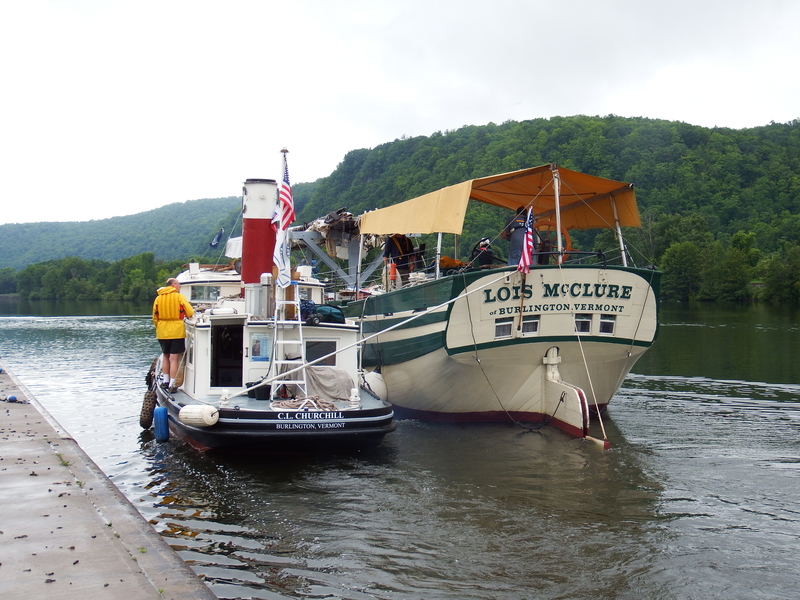 Here they were heading for a set of shows in Canajoharie. More to come. 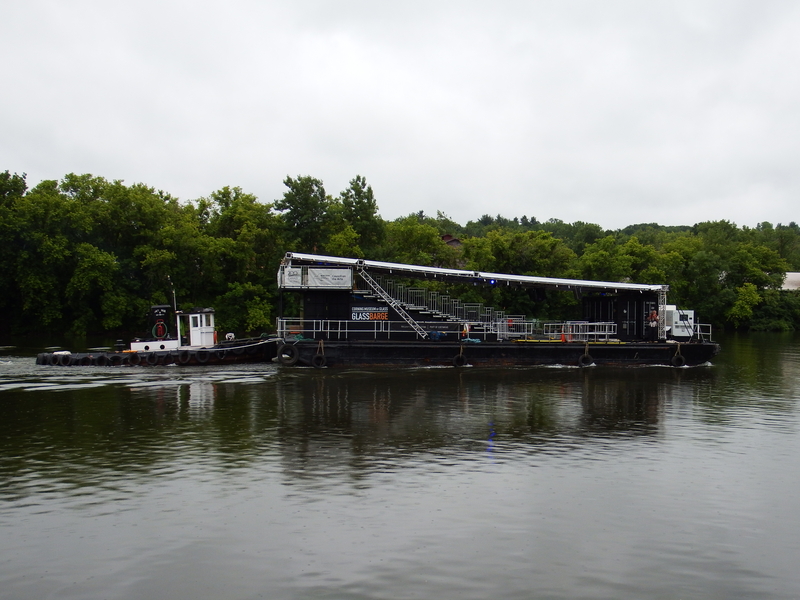 Again, if you have not checked out this link for their schedule–the water portion of which ends in Watkins Glen on September 16, click here. 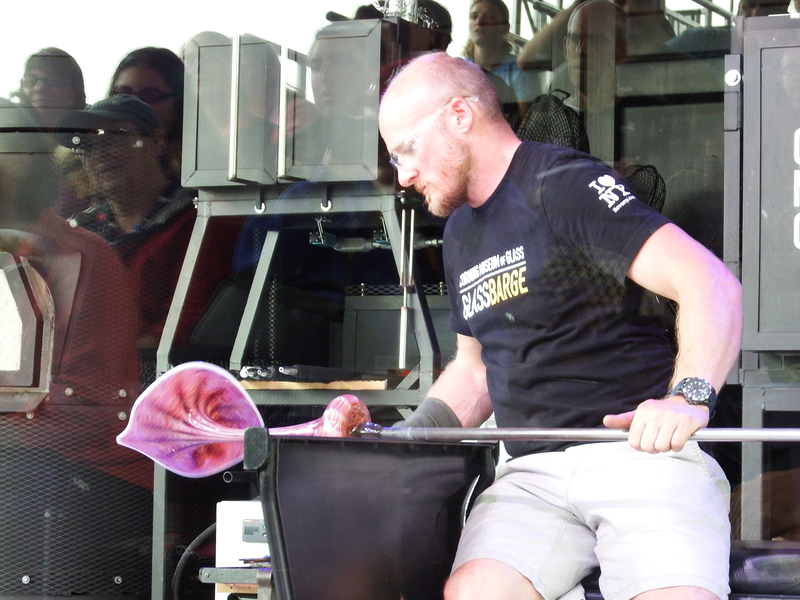 Below is a vase I witnessed a glassblower make in less than 15 minutes! All photos by Will Van Dorp, who reiterates that I take all the photos credited to me on this blog; any photos taken by anyone else–collaboration I encourage–I attribute accordingly. More photos of the Great Race soon.
. . . illustrating what will be lost if present course is maintained. If you don’t know what’s likely to happen imminently, Urger is NOT to be reefed. 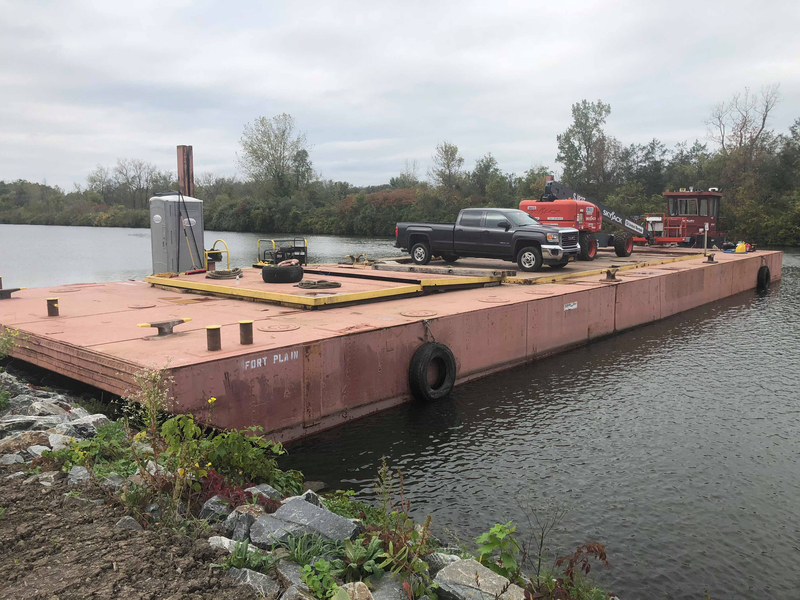 But, it’ll be beached at Thruway Lock 13 “living history” exit, with holes “punched” in the hull and that beaching will cost –I’m told–over $3 million. 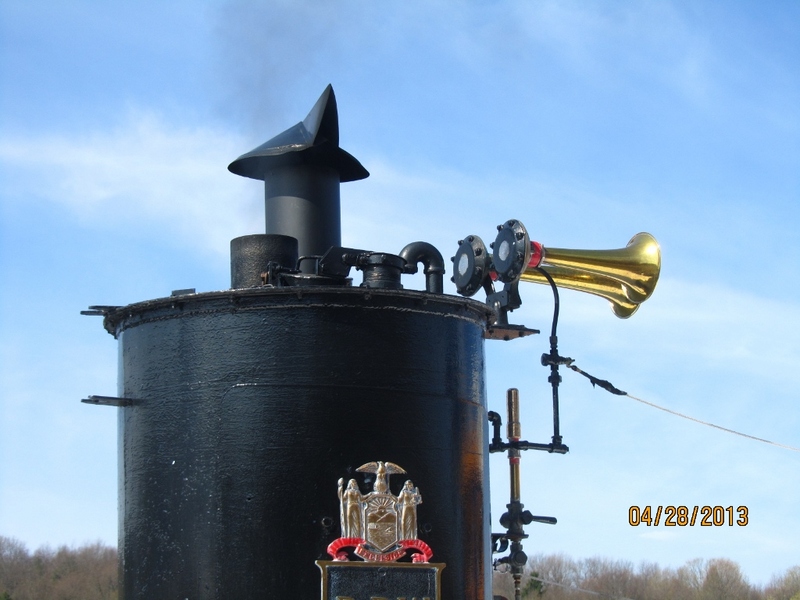 First, listen to this engine, as I recorded it four years ago on a calm day above Amsterdam NY. 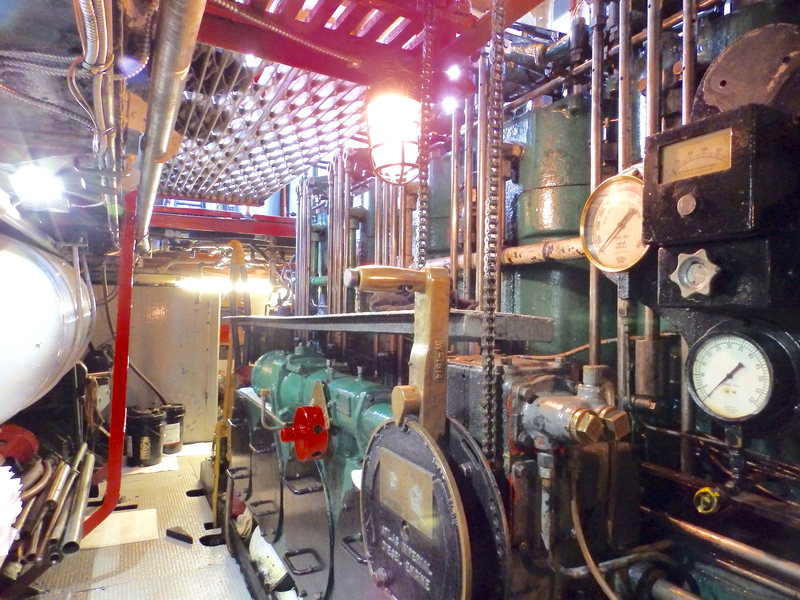 Click the thumbnail below left for the sound from inside the engine room and . . . right, from outside. It’s like the steady panting of a racing horse. Click here for a list of remaining Atlas-Imperial engines, although I don’t know how out-of-date this info may be. here, the camera is looking aft along the port side. Here’s the view port side looking down. 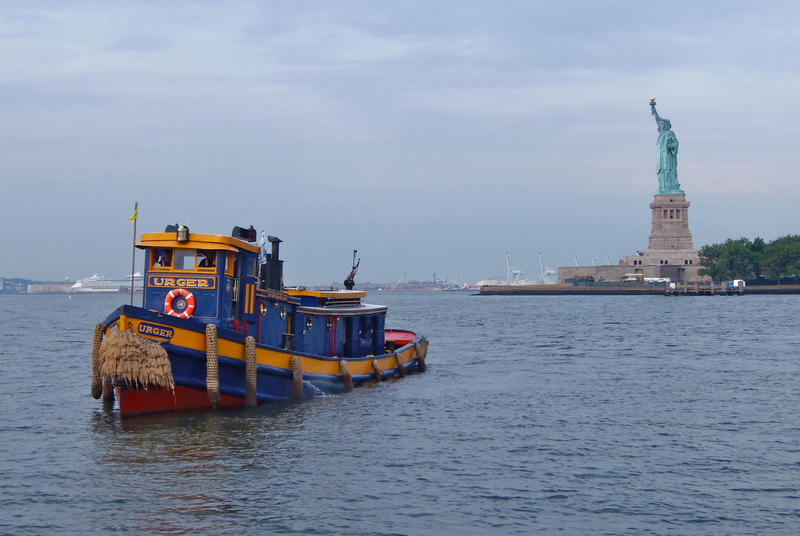 one of about two dozen NY vessels on the National Register of Historic Places, has been on that list since November 29, 2001. 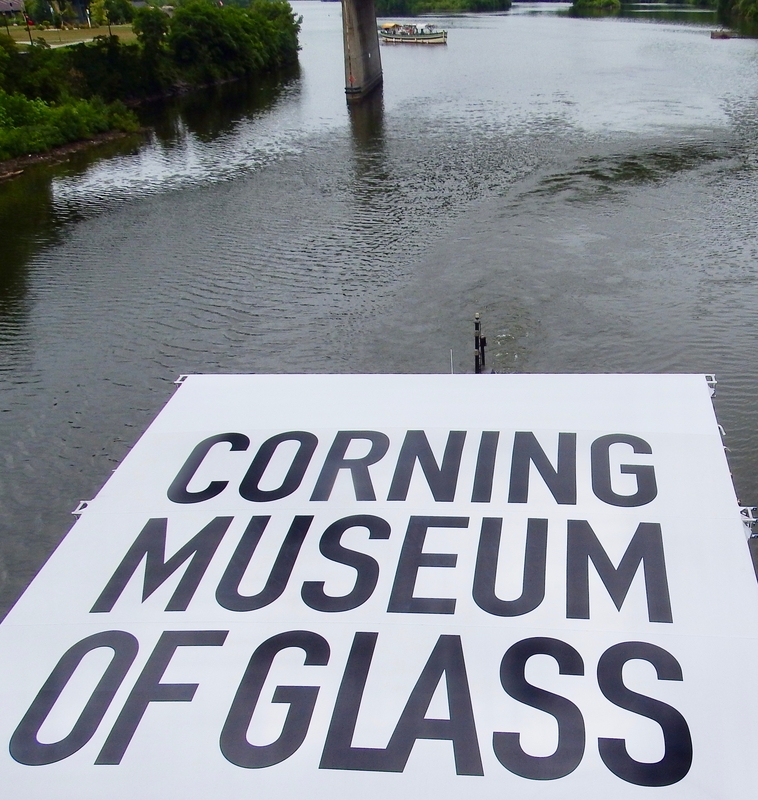 Click here for what that means in terms of significantly changing the historic floating structure. 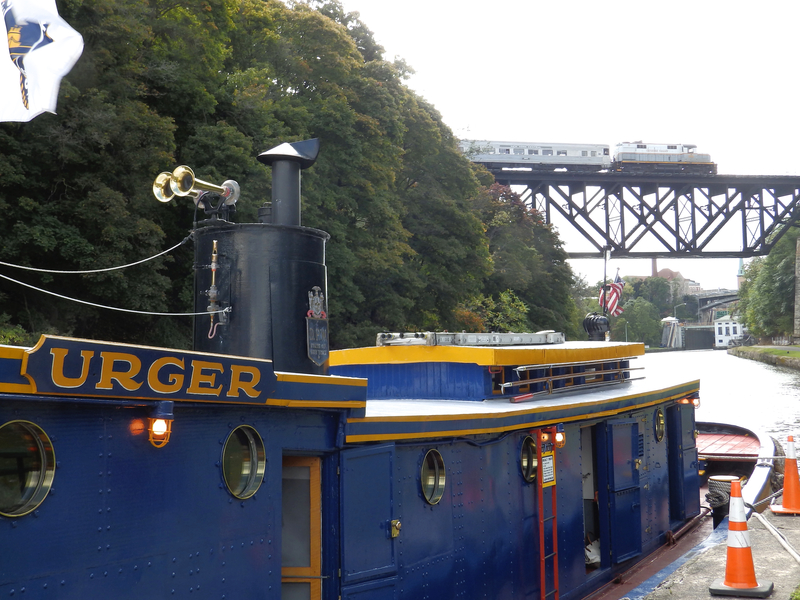 Urger was built by Johnston Brothers Shipyard in Ferrysburg, Michigan, in 1901, originally as H. J. Dornbos, a fish tug. My point . . . if she’s been around this long and is in this good shape, that’s prime reason to keep her that way. 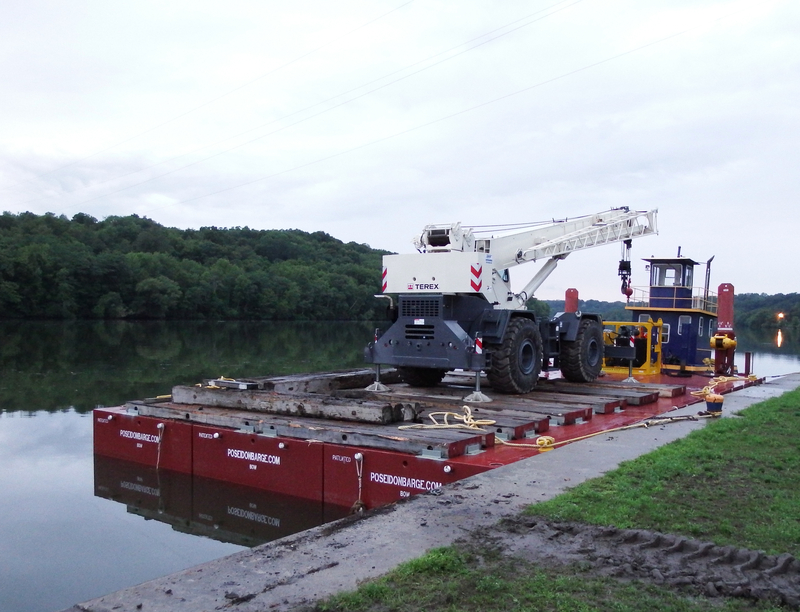 Urger faced significant change before, back in the late 1980s, ending Canal maintenance duty in October 1987. 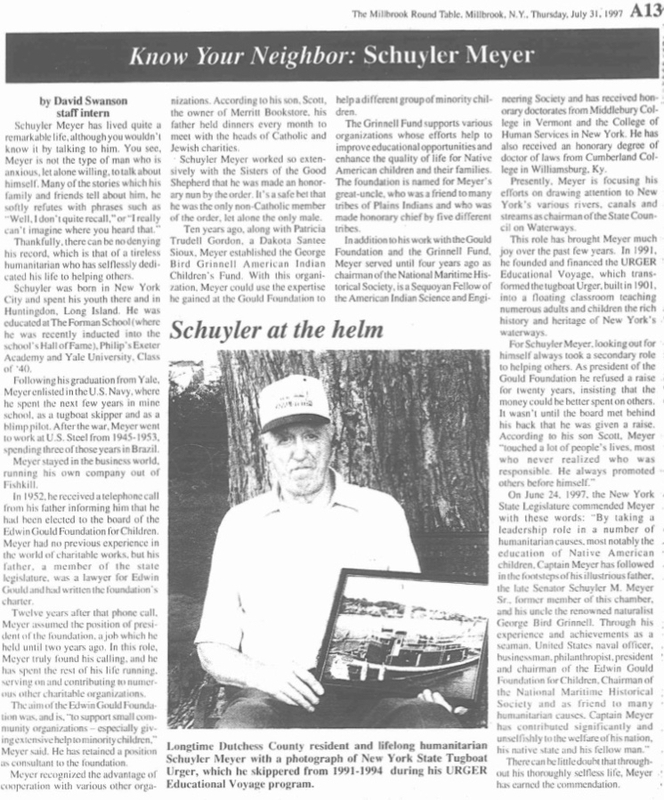 Then, Schuyler Meyer (1918–1997) stepped forward with a proposal to save her by making her the “ambassador vessel” of the NYS Canals that she did become. During those ambassador years, scores of thousands of folks–especially school kids–saw her, walked on her, learned from her about NYS. Read the whole article below if you have time, but signifiant info is concentrated in the rightmost column. Look at the image he’s holding in the photo. the Upper Bay of New York City, and all the great little towns in between. I lack the photos myself, but I know she’s been to the southernmost point of the Finger Lakes and upper reaches of Lake Champlain from this video clip. So what can be done . . . especially since, given the imminence of converting Urger to a “static display,” time is so short? 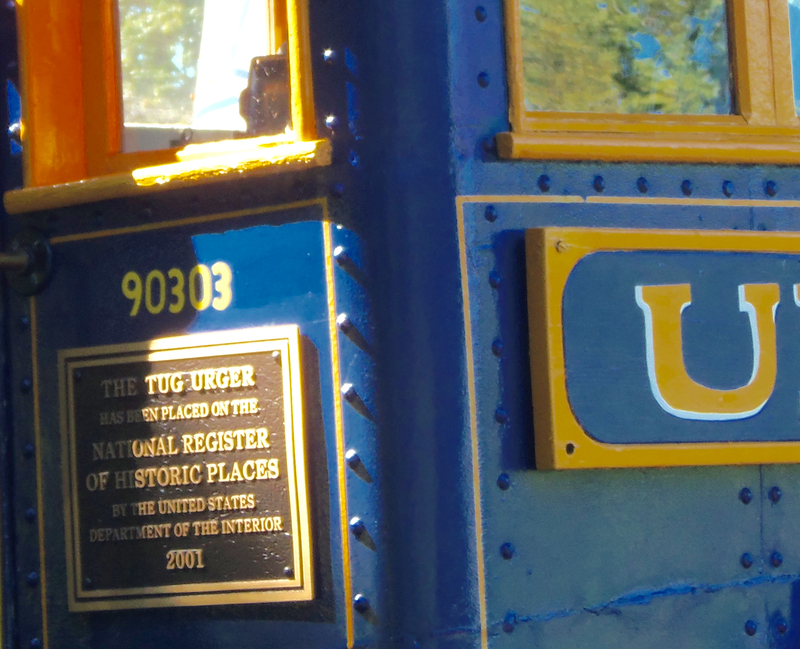 First, share this post with anyone you know who might care about Urger. Seek out your loud, articulate, reasonable, and well-known advocates who know [connected] people and can speak out in the meetings, press, and blogs. It’s summer, so key political and agency leaders might not be reading their mail, forwarding it to folks with less decision-making power. Congressman Paul Tonko would like to hear from you. State legislators might be contacted in their home districts, where you can even walk into their local offices. Talk to your local mayors, business leaders, and union officials. I was born upstate but haven’t lived there since the 1960s. 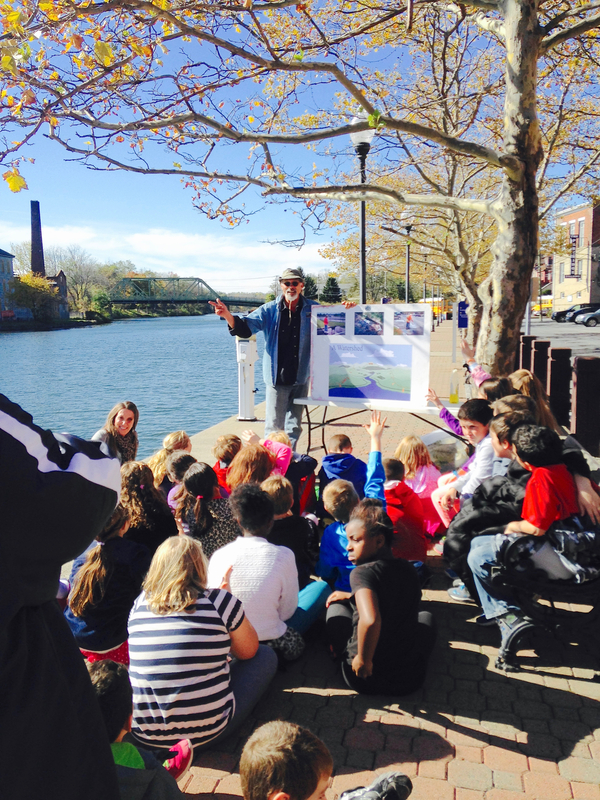 Educators, especially in Canal corridor towns, have benefitted from the Urger program over the past quarter century. They might choose to exercise power through NYSUT rather than as individuals if anyone in to better get the attention of government. Finally, if the choice were between spending no money to beach Urger vs. spending money to keep it afloat and active, that would lend support to the idea of beaching her. 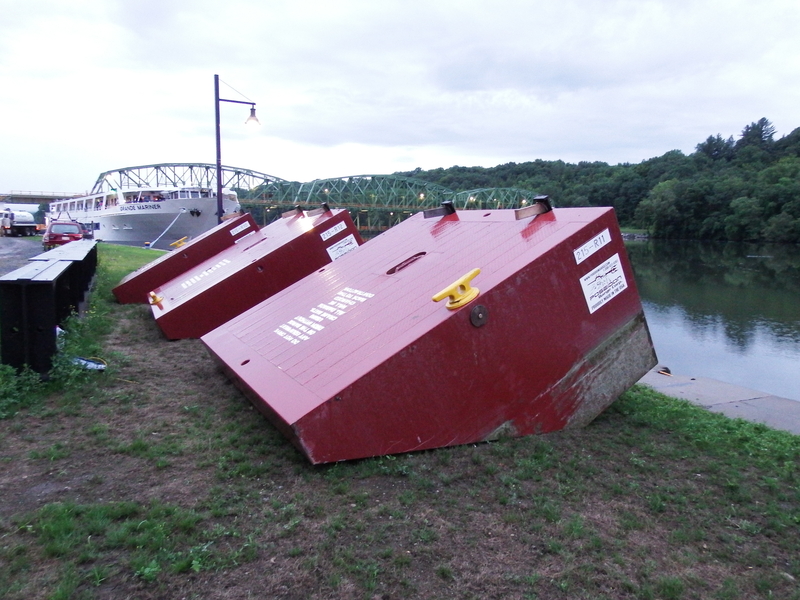 BUT, significant money (in the seven digits) will be spent to beach her at Lock 13 Thruway exit. Thanks for your attention. All the color photos here were taken by Will Van Dorp, except the one below, taken by Chris Kenyon in Port Gibson in 2014. 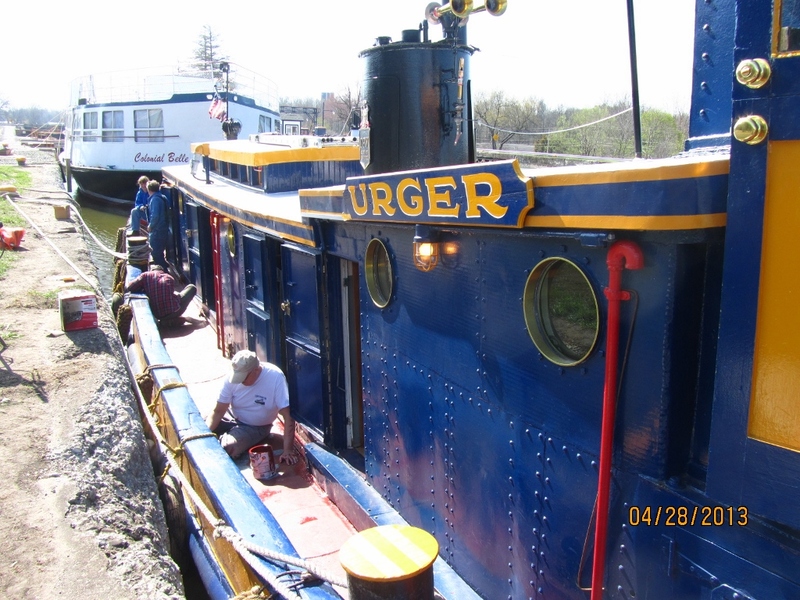 Personal disclosure: I worked as deckhand on Urger during the 2014 season, on a leave-of-absence from my other life. I spent about 100 nights and days aboard her between June 6 and October 30, i.e., about 2/3 of the time between those dates. 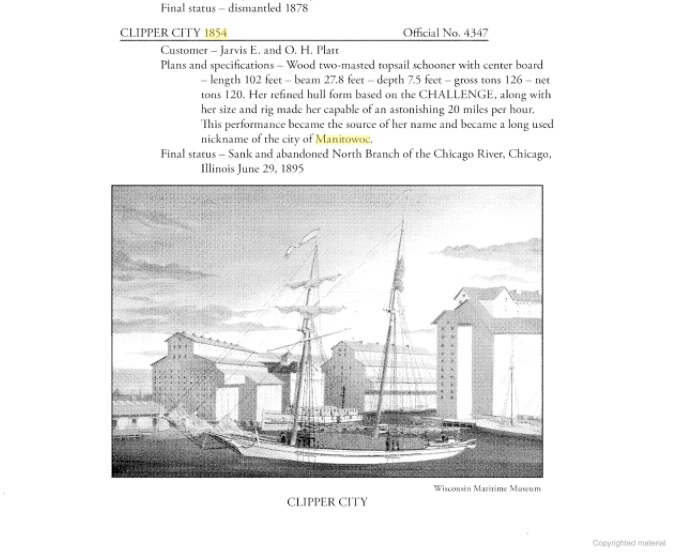 Some of the hundreds of references to the boat on this blog can be found here. I hope you agree with me that NYS gains more by keeping her afloat and active than by beaching her. Pass it on, if you agree.